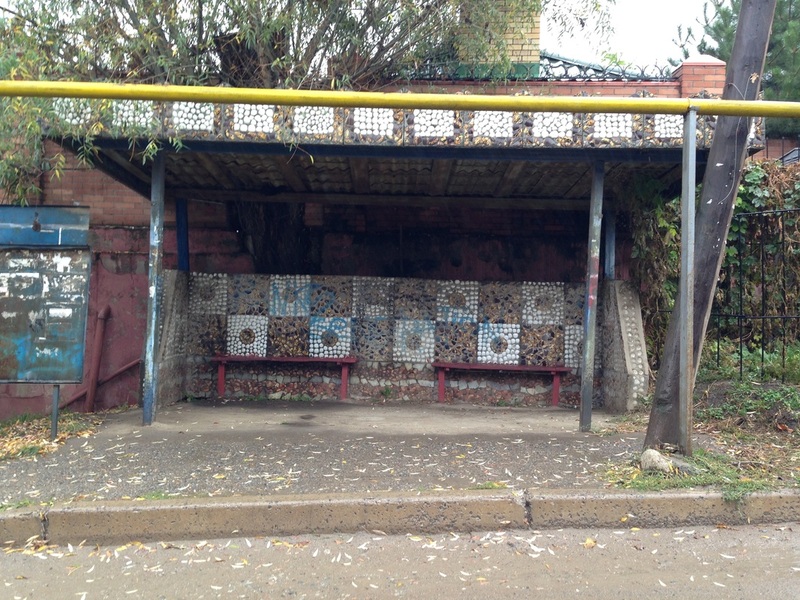 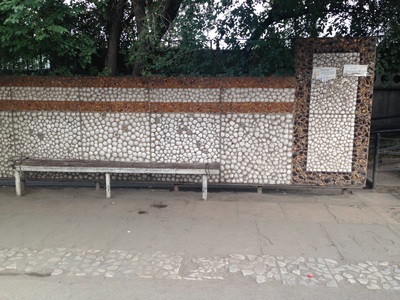 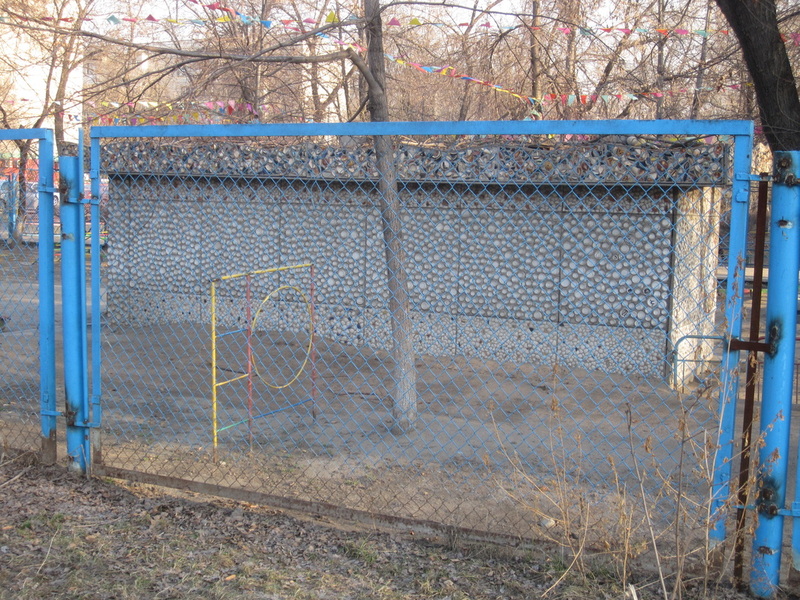 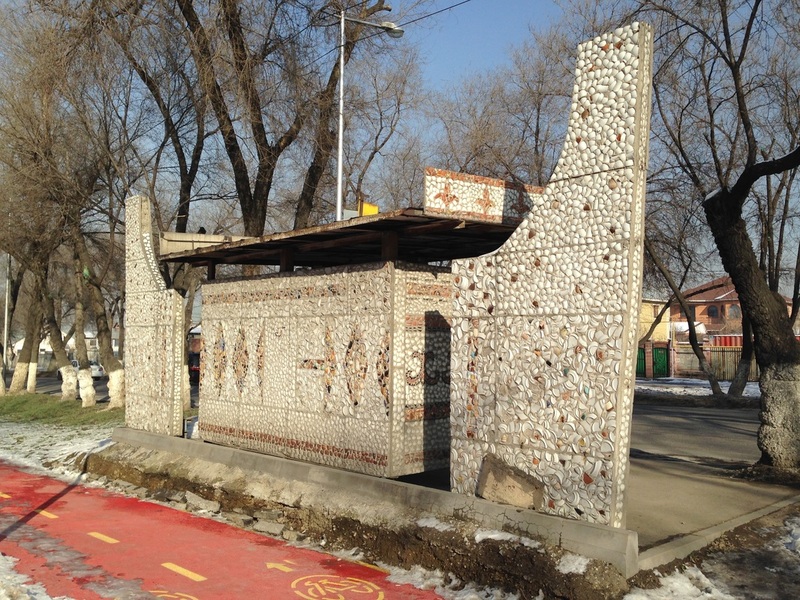 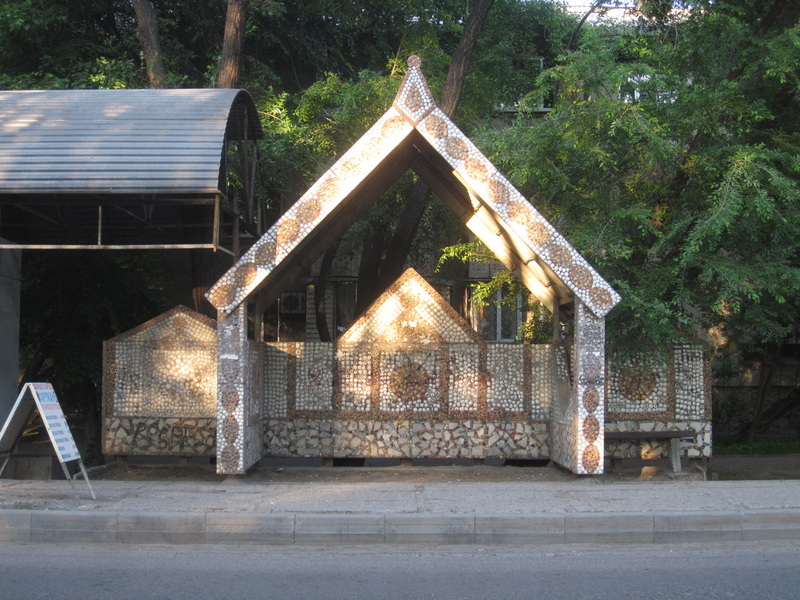 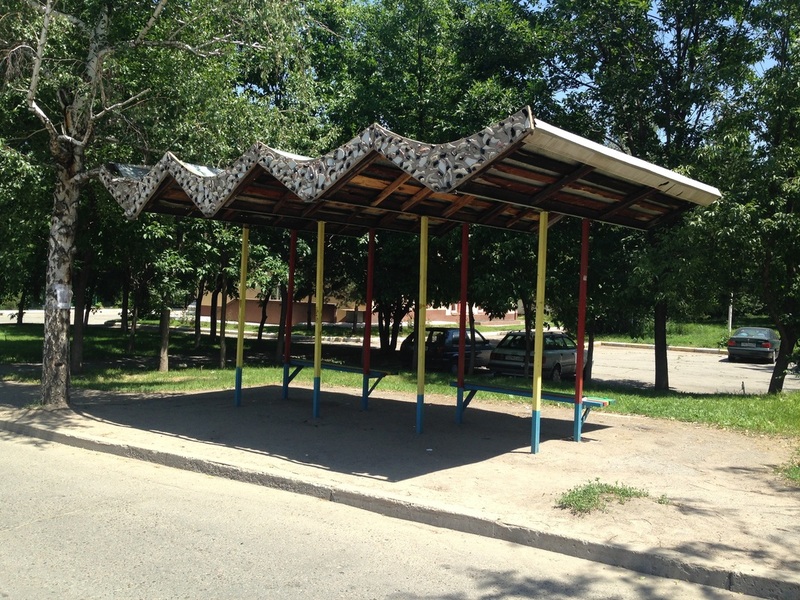 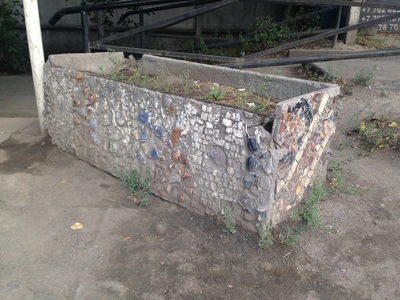 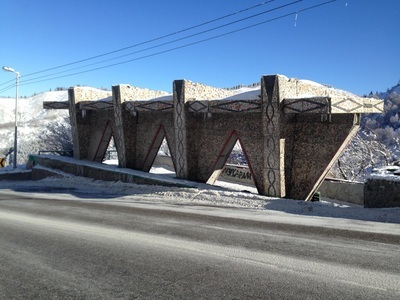 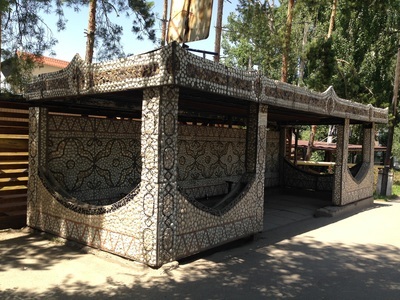 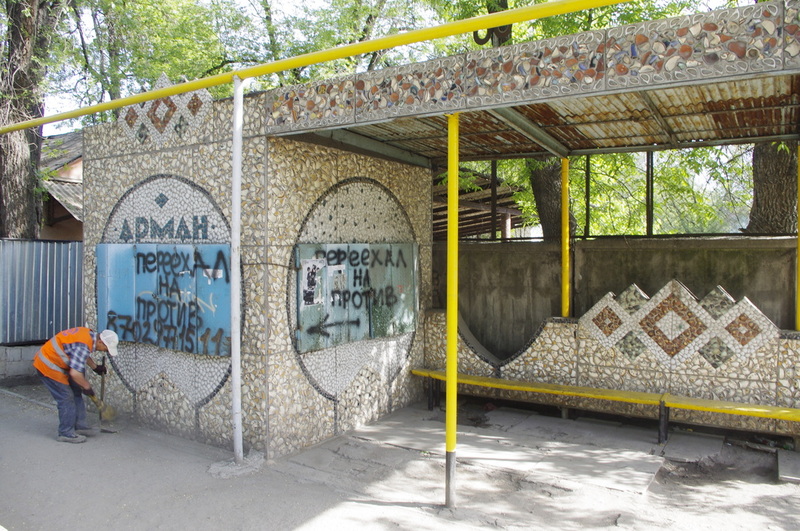 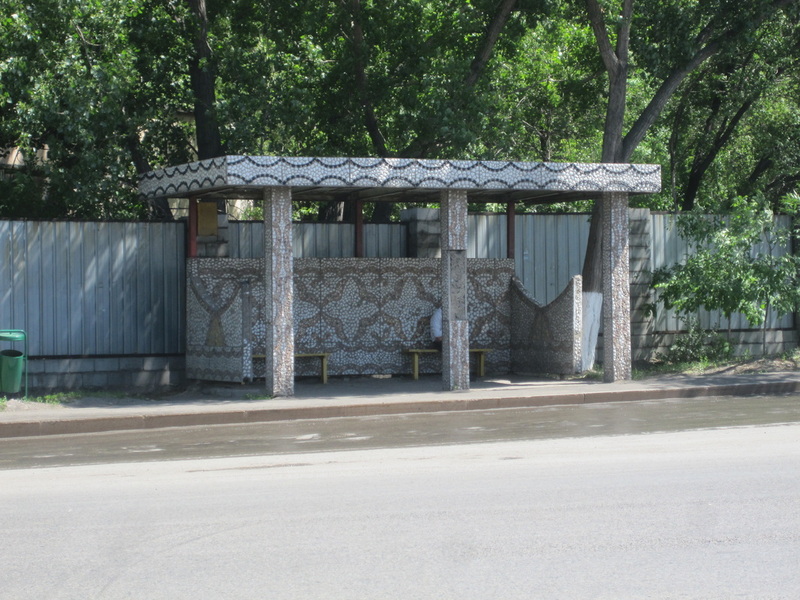 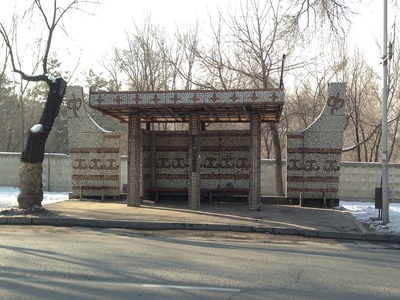 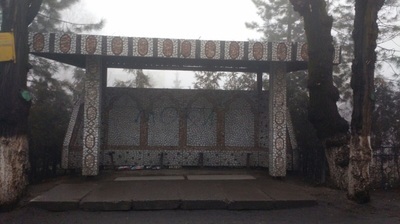 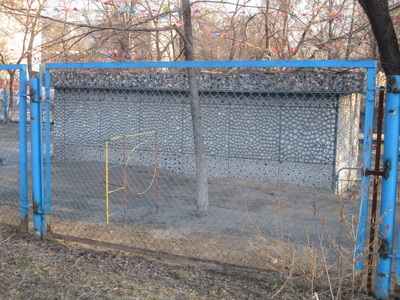 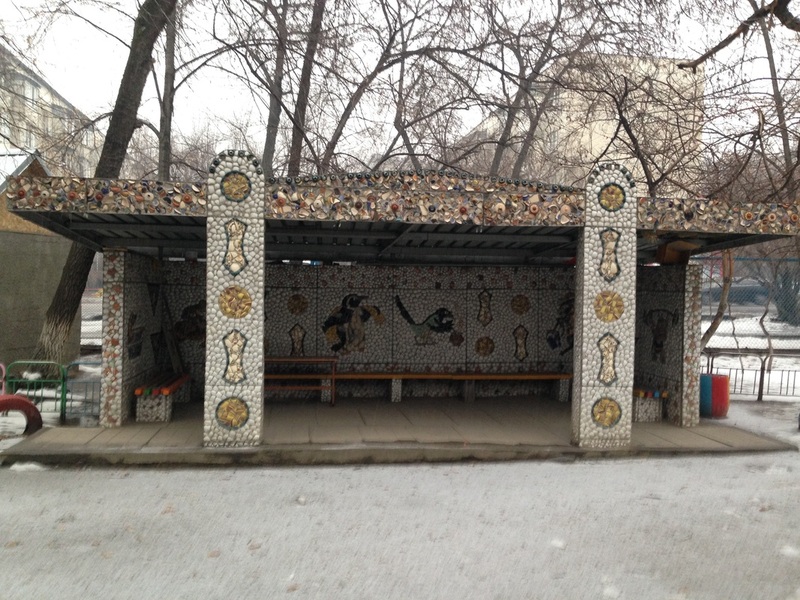 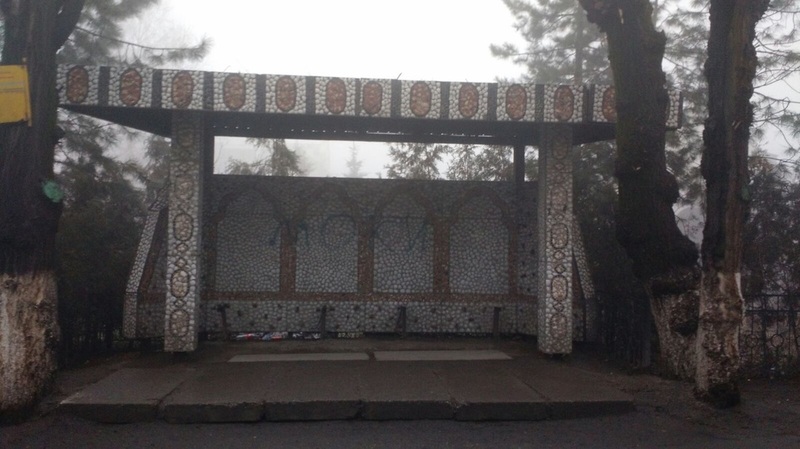 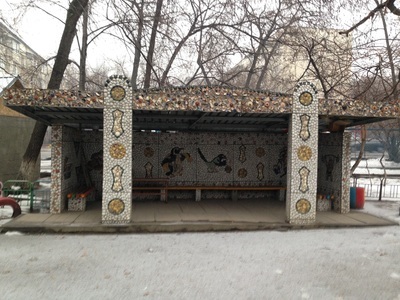 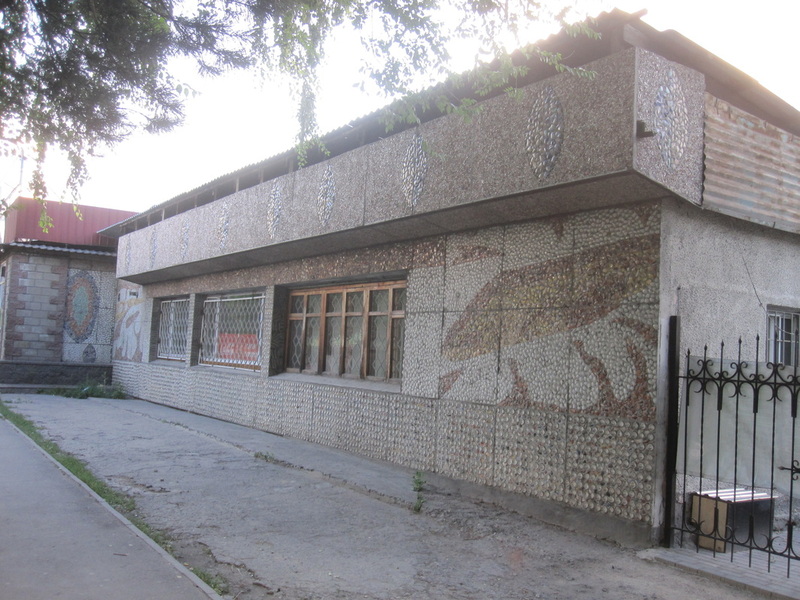 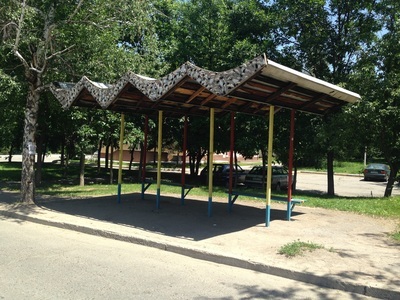 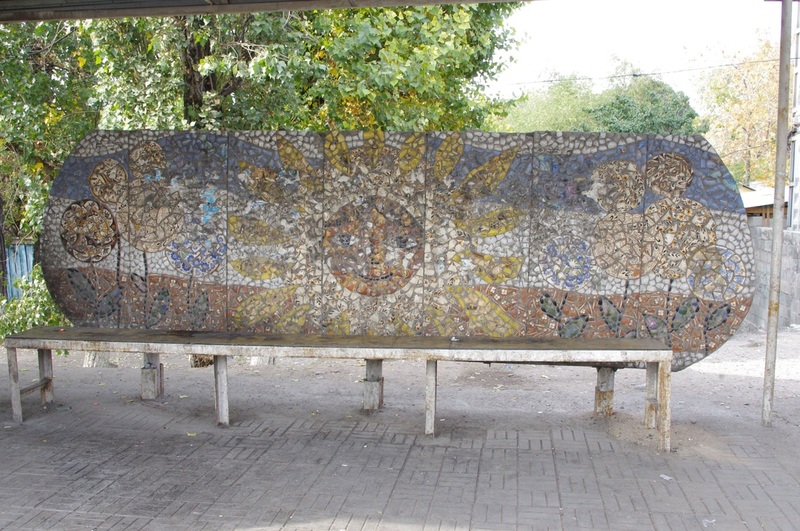 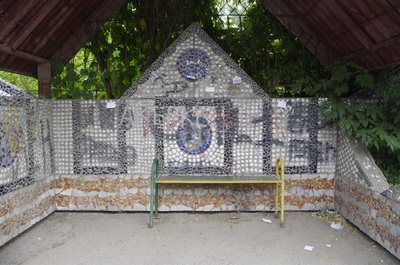 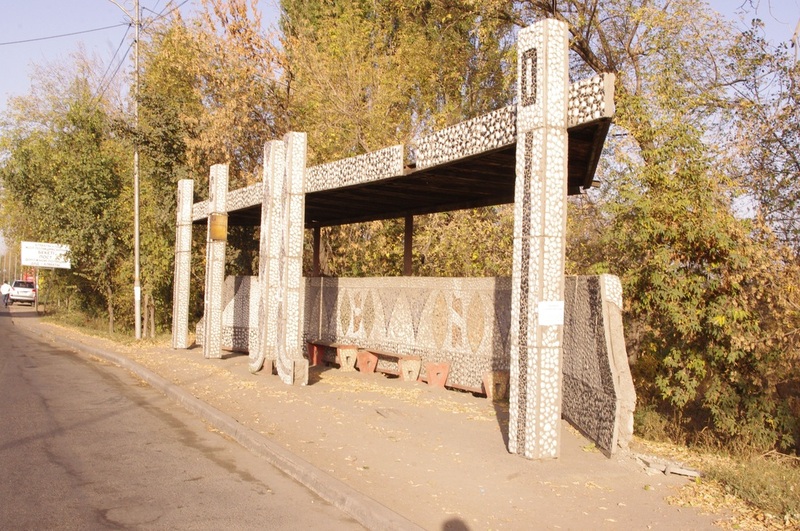 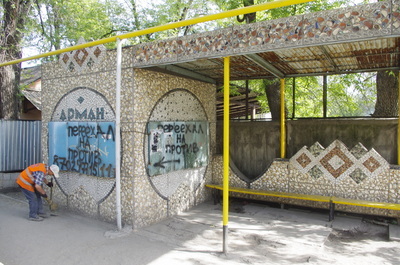 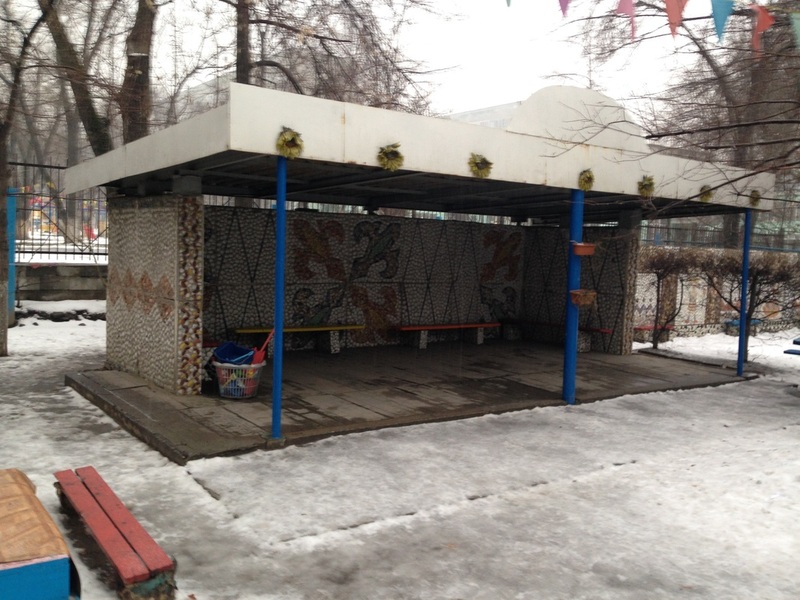 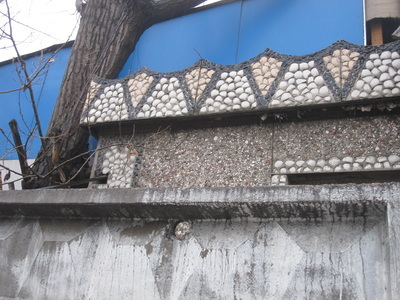 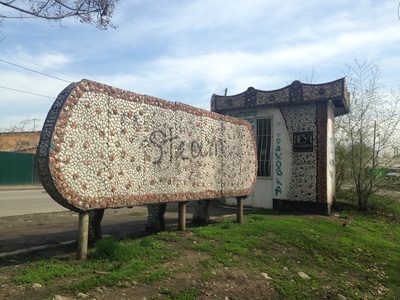 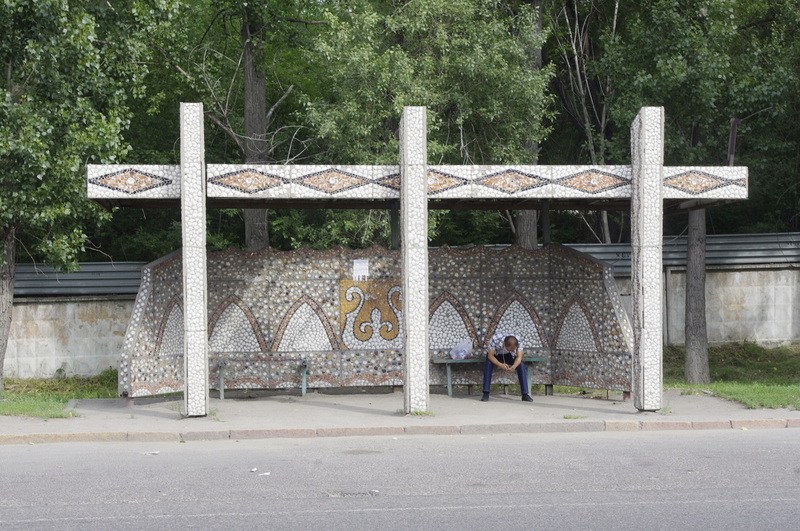 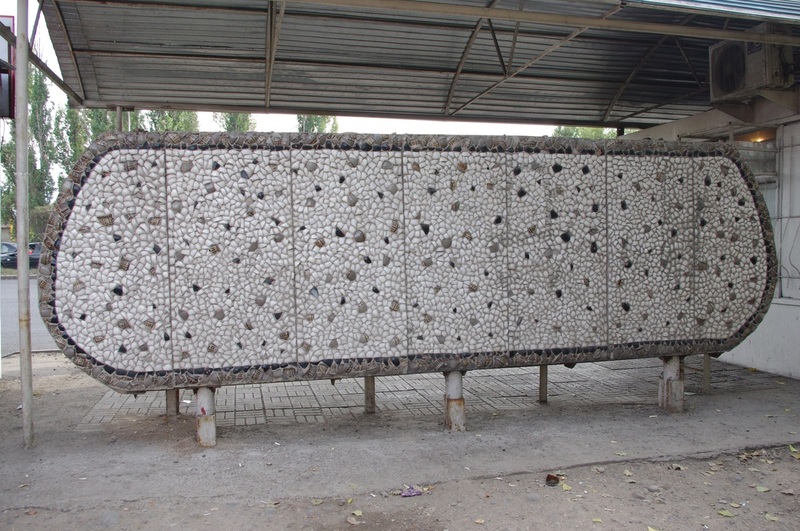 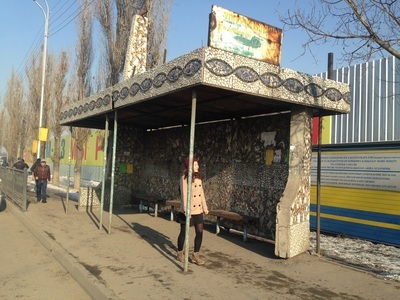 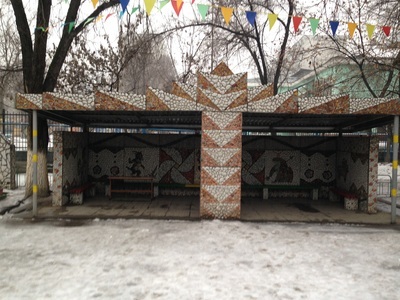 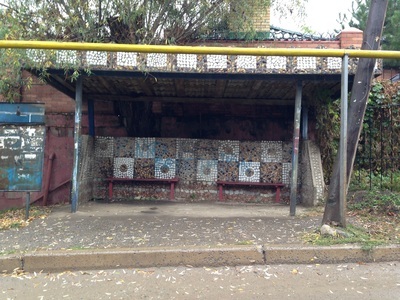 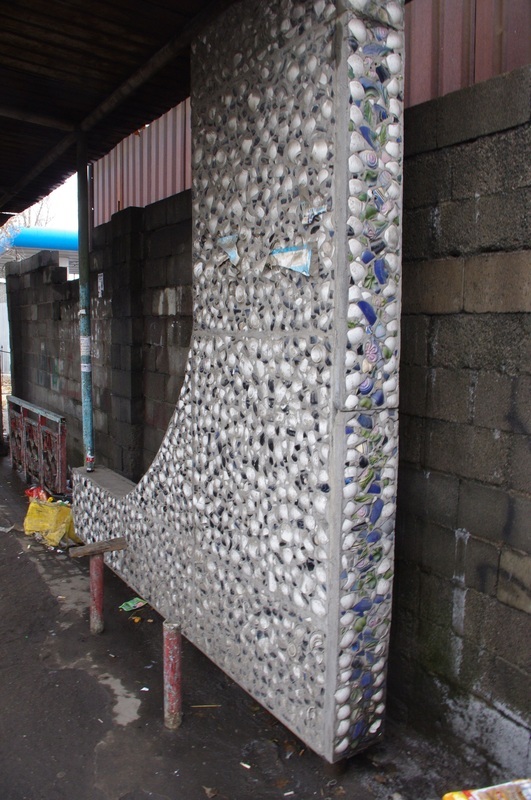 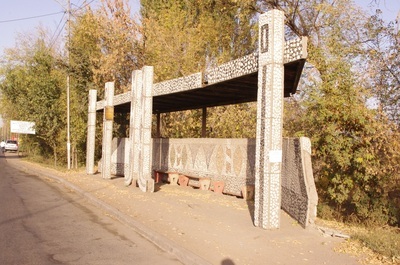 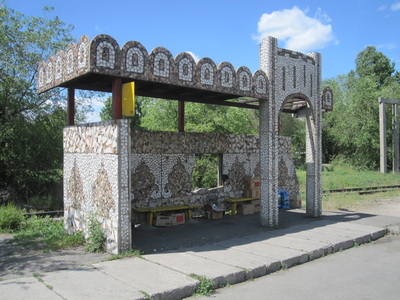 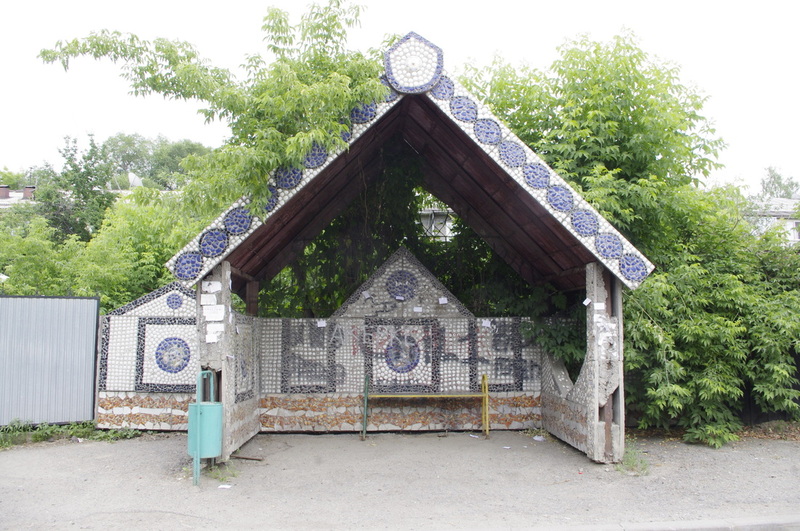 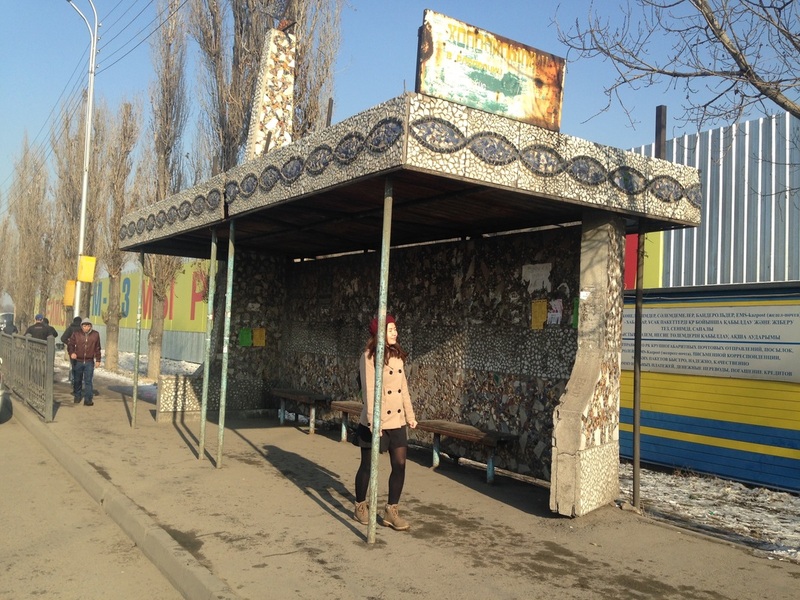 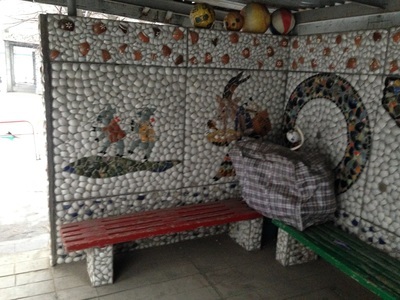 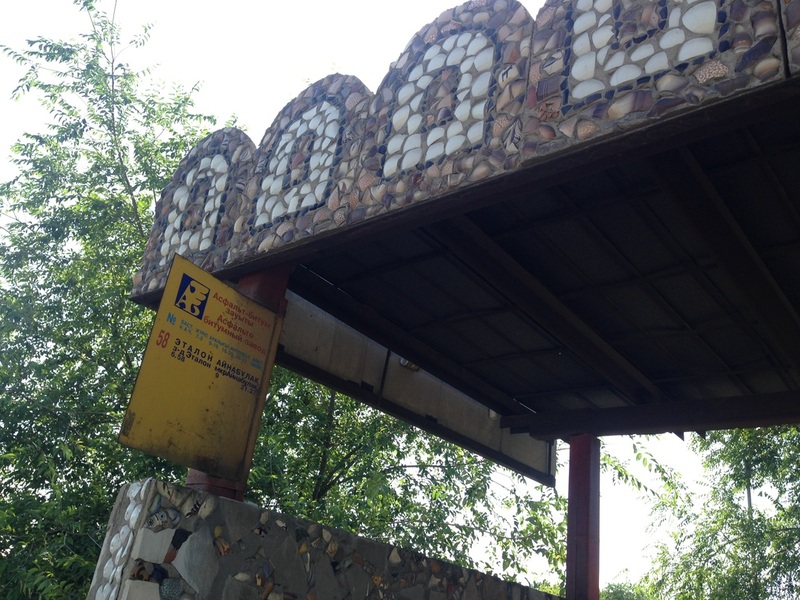 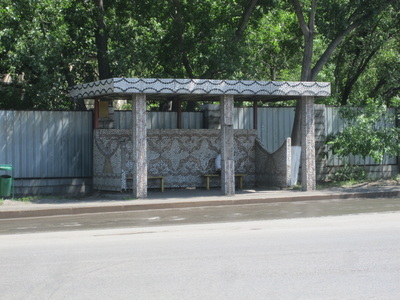 There is a distinct series of Soviet-era bus stops that are covered in thousands of china shards. 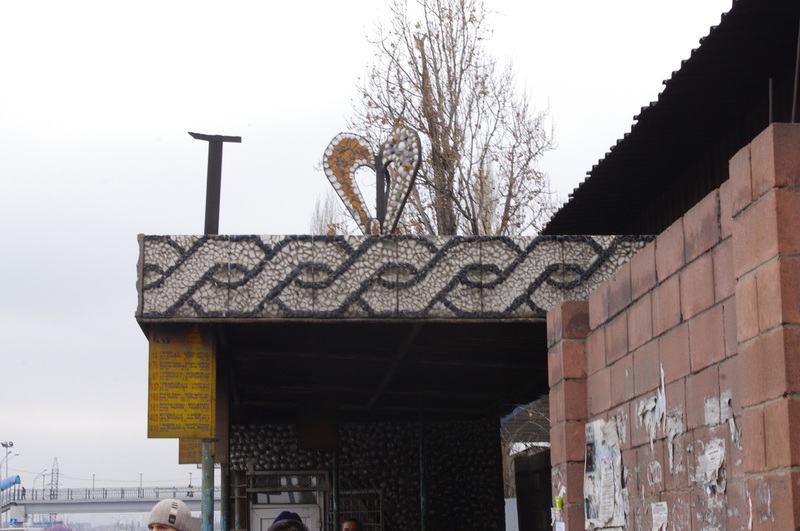 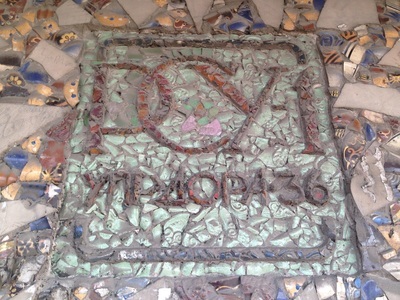 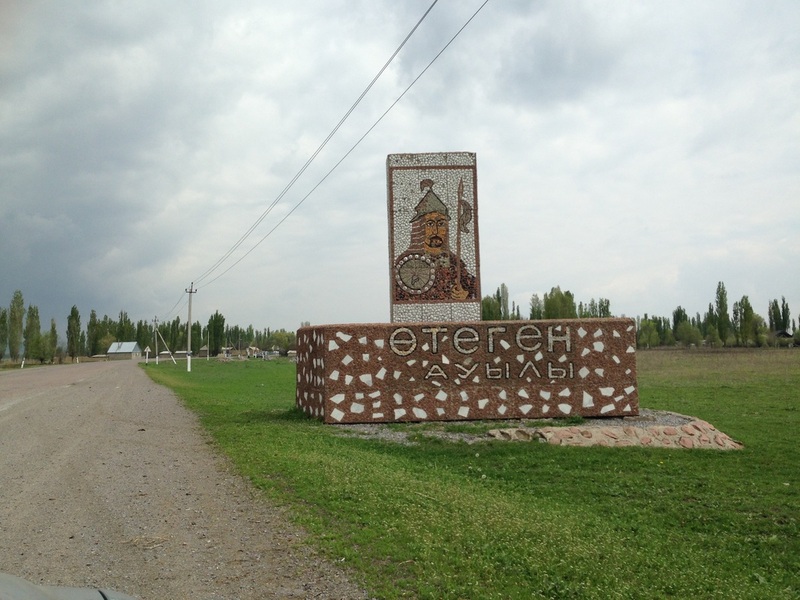 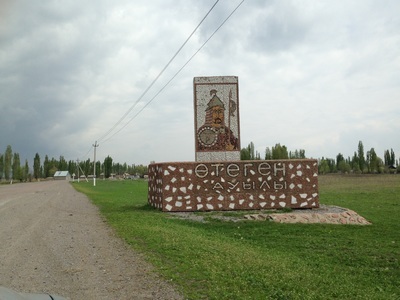 Online commenters have suggested that the "shard stops" (черепковые остановки; cherepkovye ostanovki) creatively reclaimed pottery from the Kapchagai Porcelain Factory north of the city. 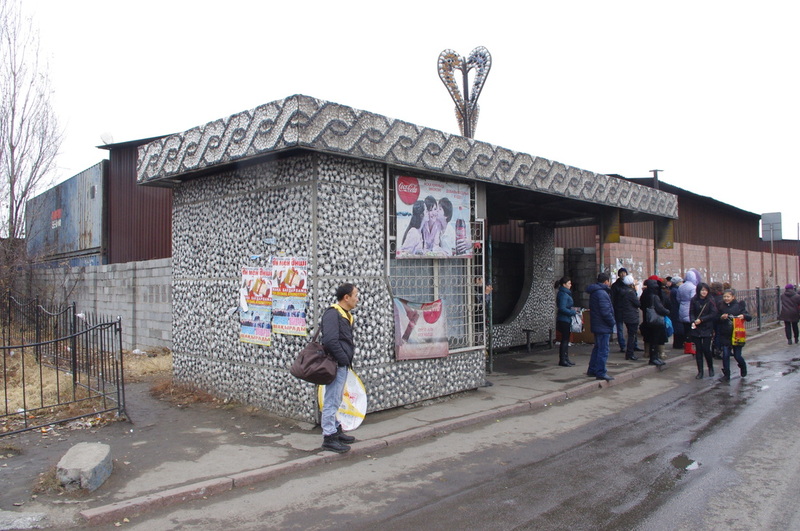 The bus stops likely served a regional bus line, as all the stops are on arteries (so-called "tracts") on the edges of town. 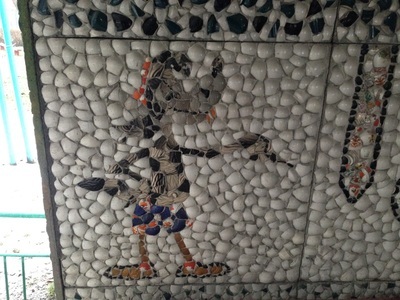 The first one I ever saw I assumed was a fluke. 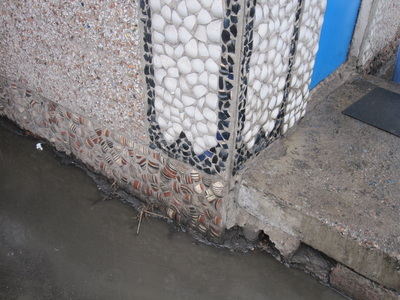 It was stranded in front of the iconic Nurly Tau business tower, surrounded by a parking lot and thus obviously defunct. 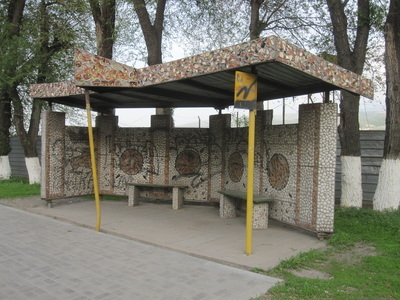 Soon, as my itineraries drew me further and further from the center of town, I was seeing them all the time, the bus stops always instantly noticeable with their glossy colors and child-like designs. When the ornament was representational, it was crude, things like smiling suns or galloping horses. 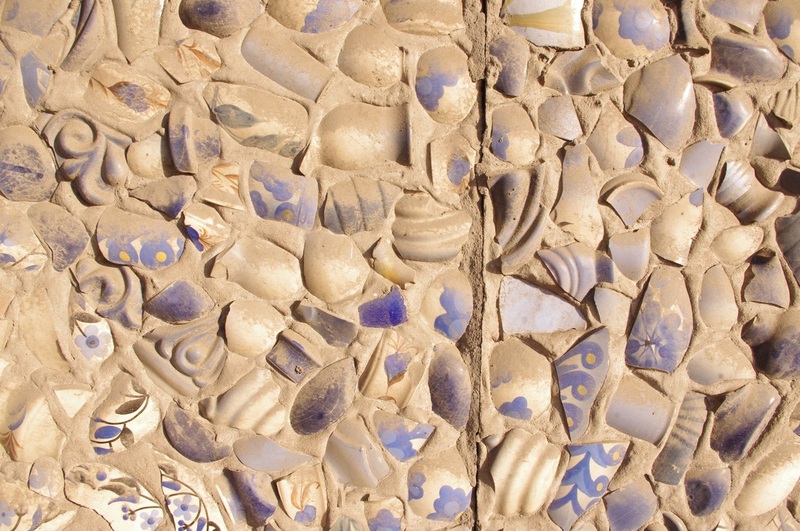 Most often, the pottery had been used to make squares, helixes, diamonds and abstract waves. 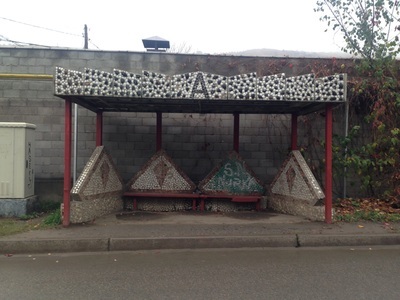 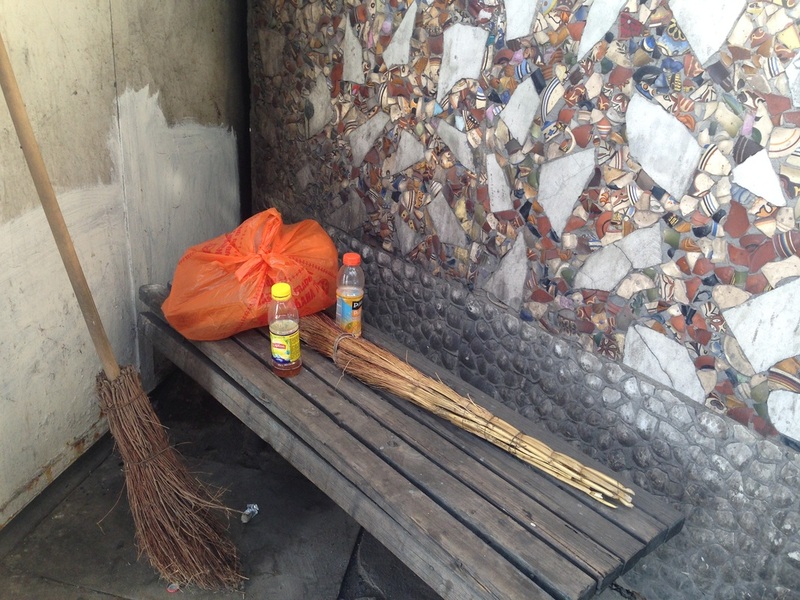 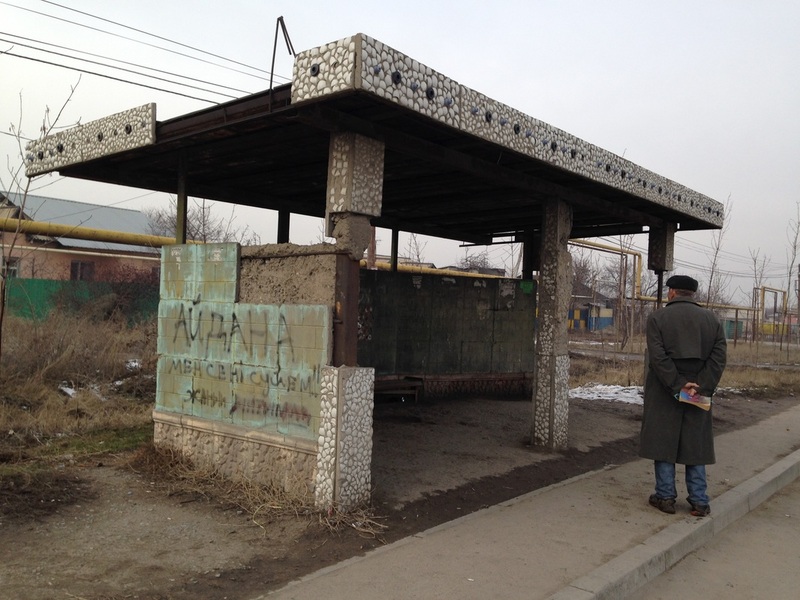 In their thrifty reuse, the bus stops looked like they had been designed by a post-apocalyptic society of scavengers. 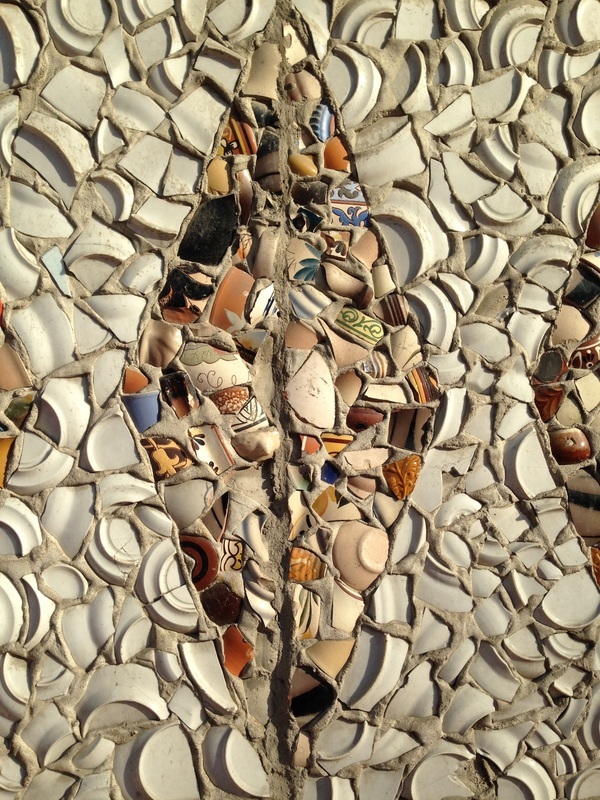 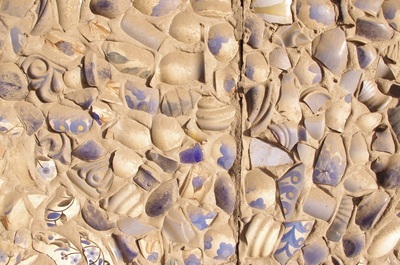 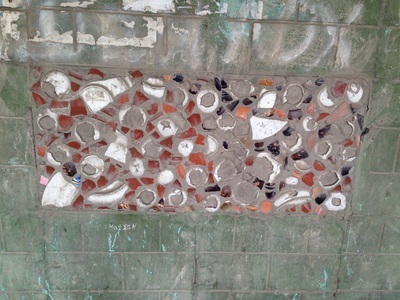 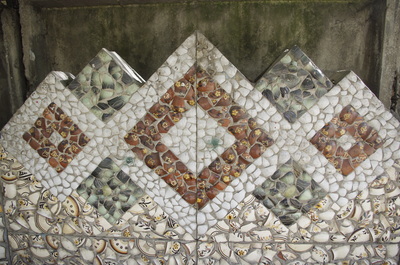 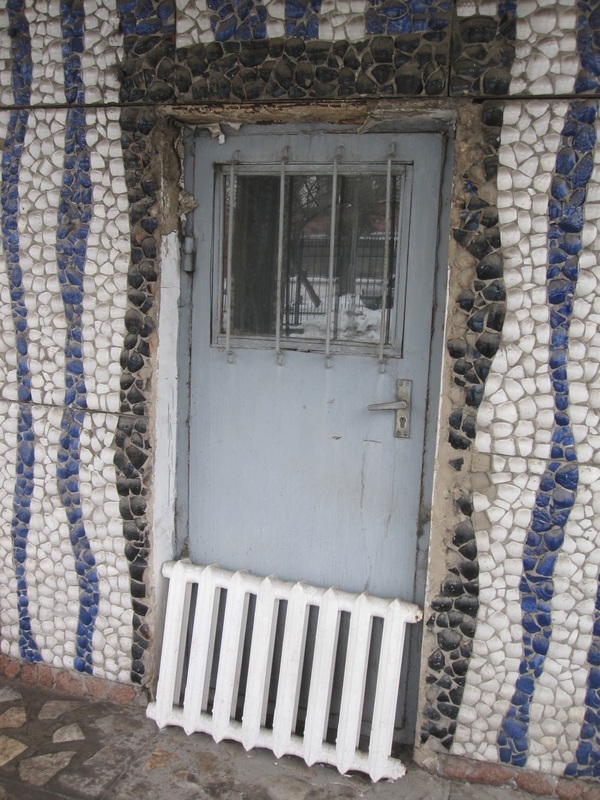 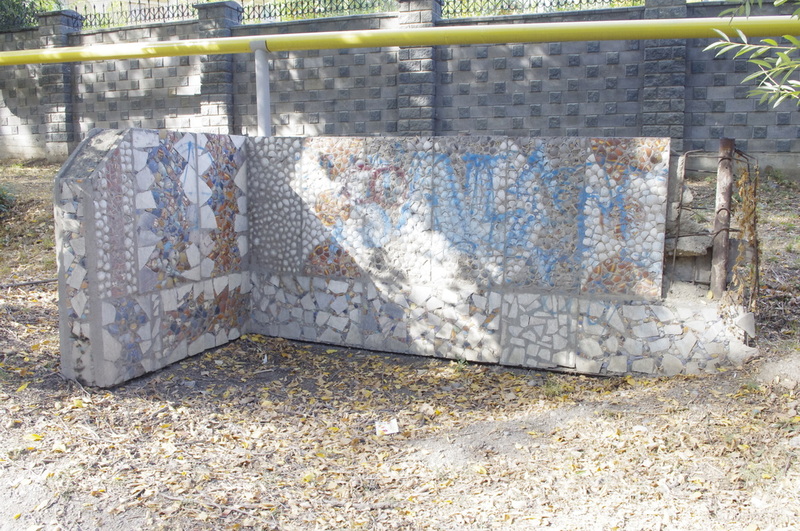 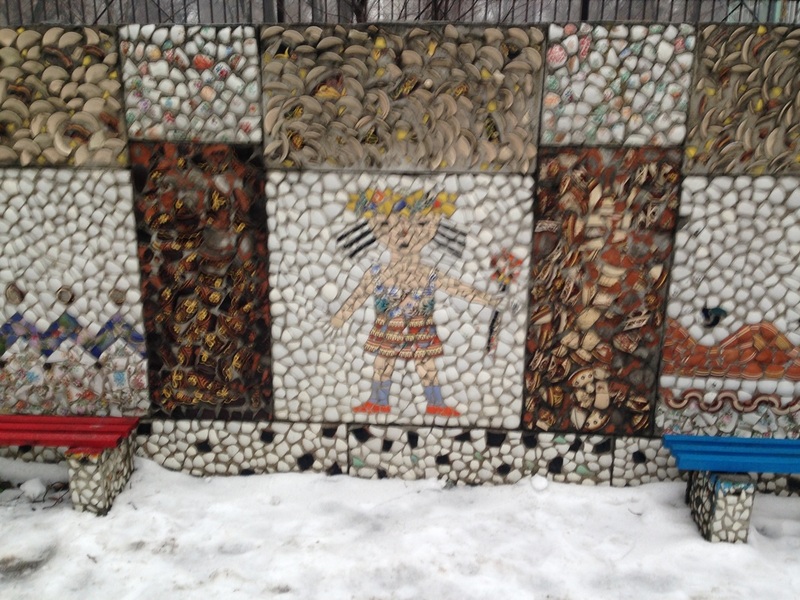 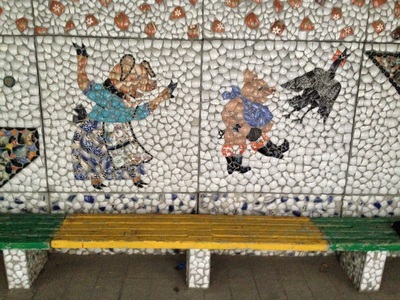 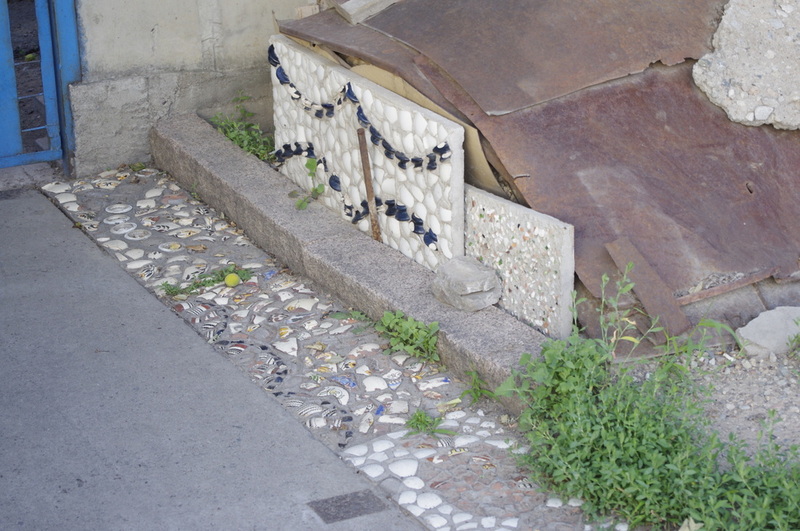 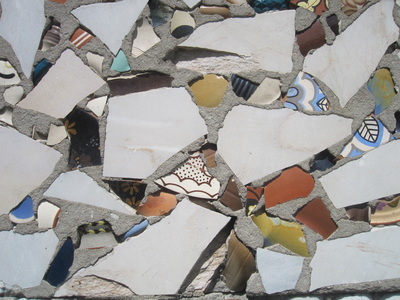 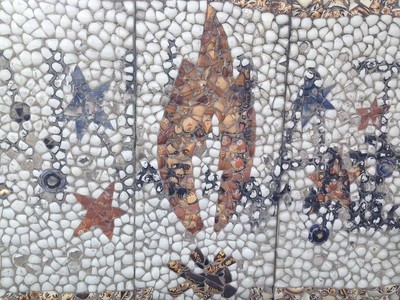 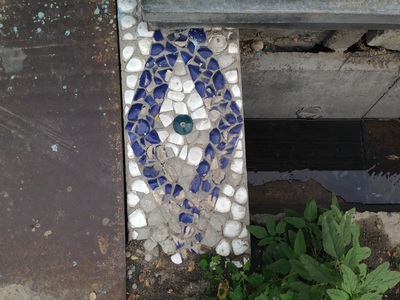 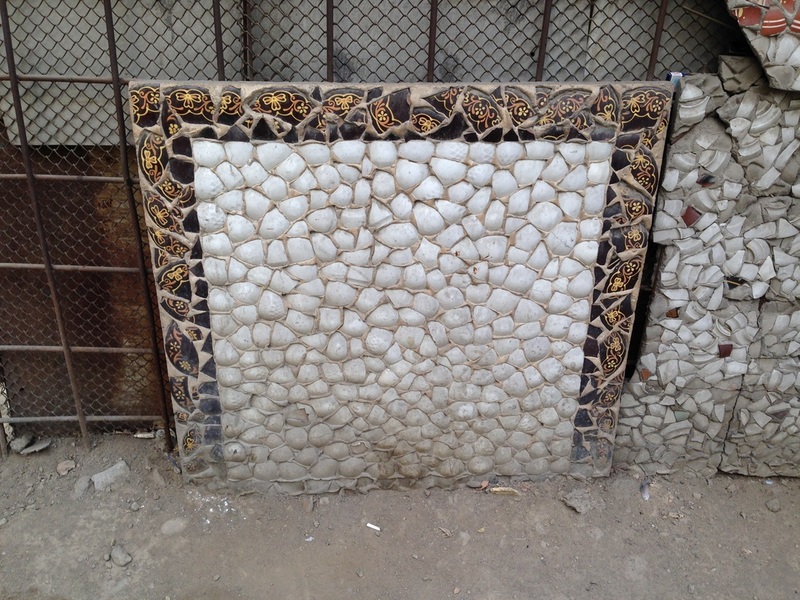 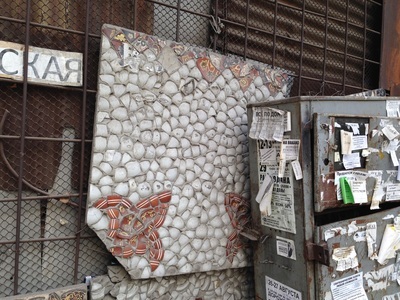 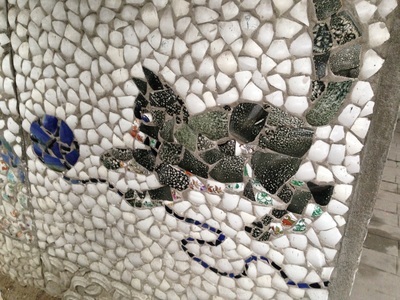 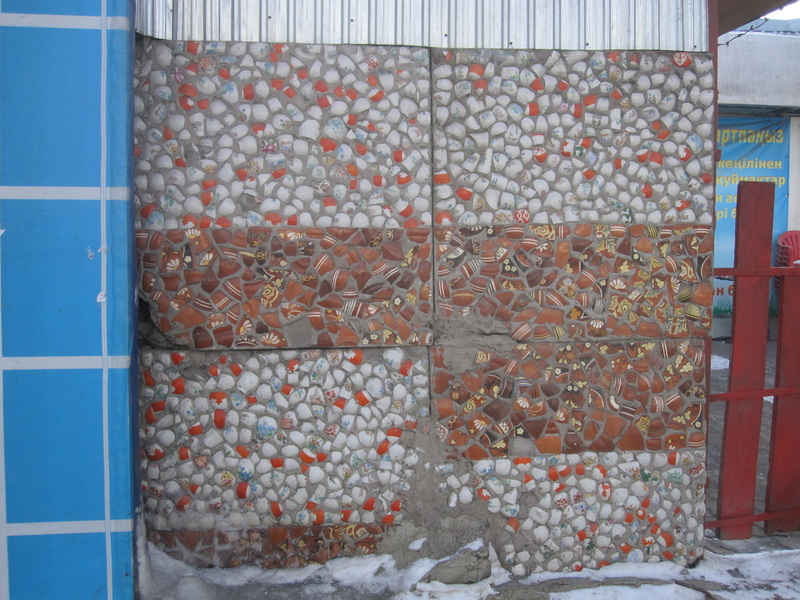 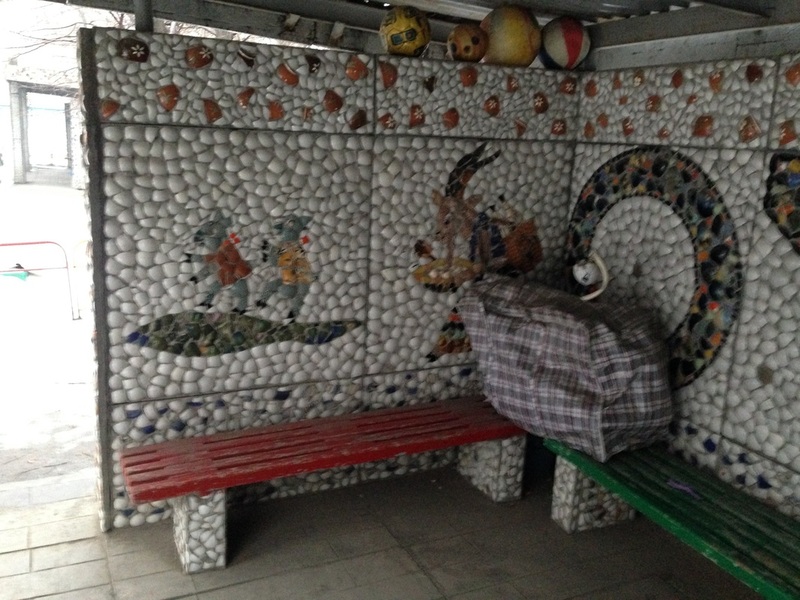 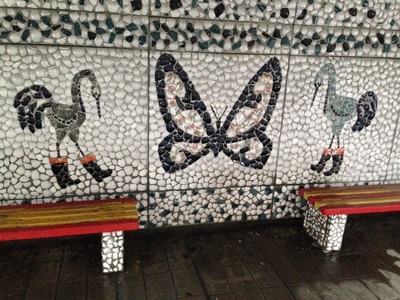 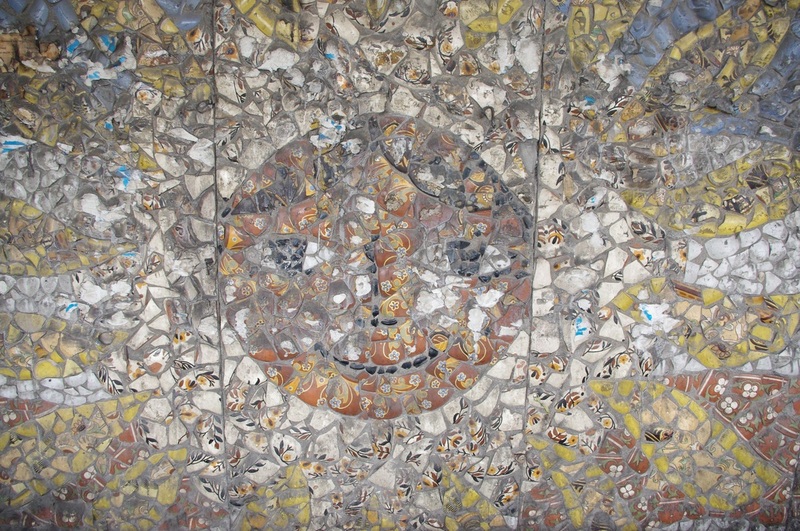 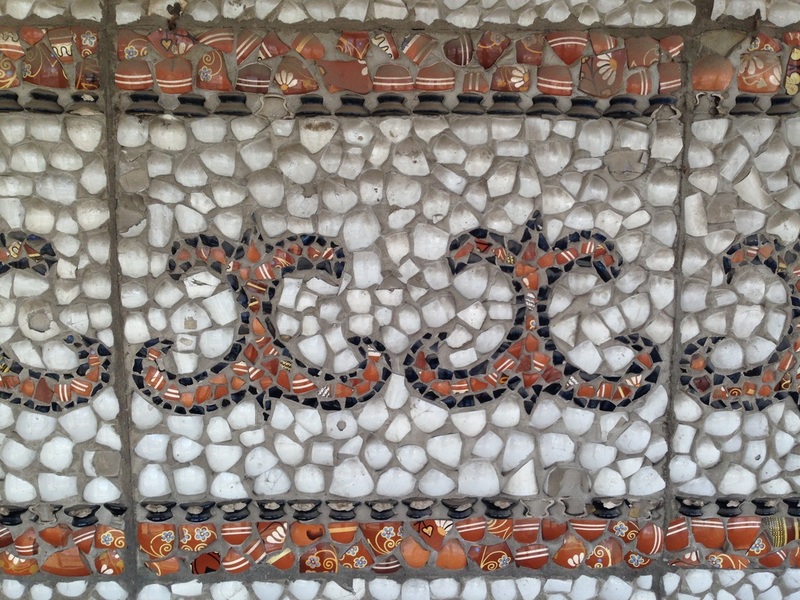 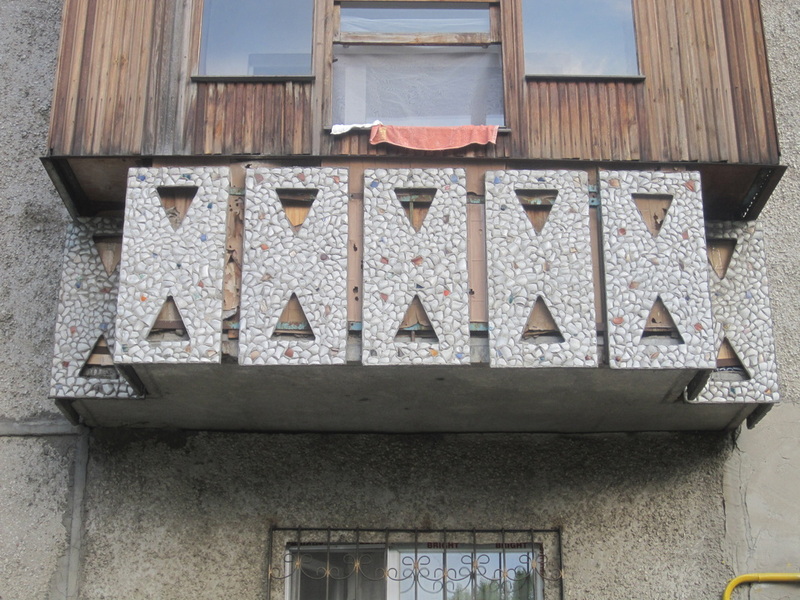 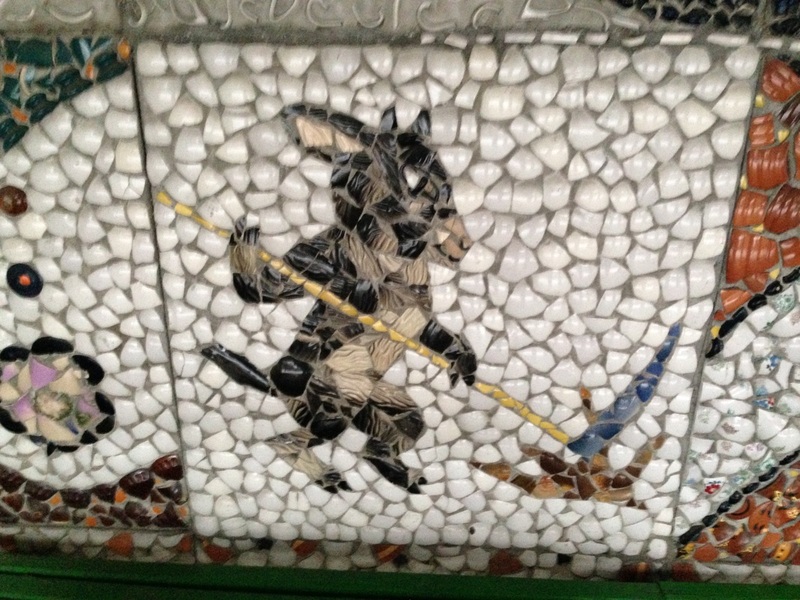 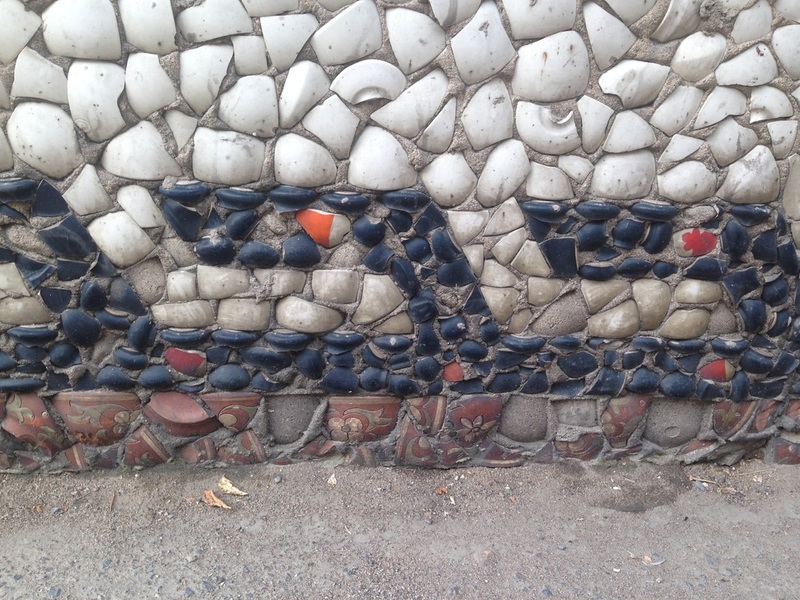 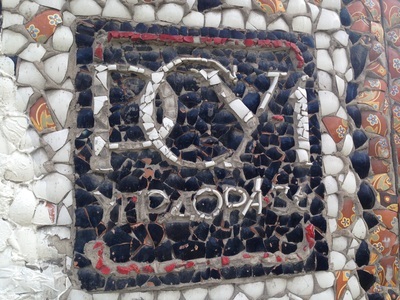 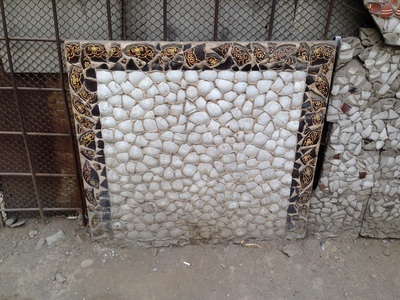 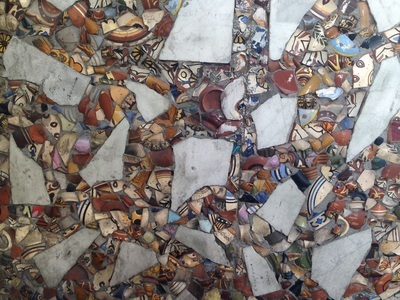 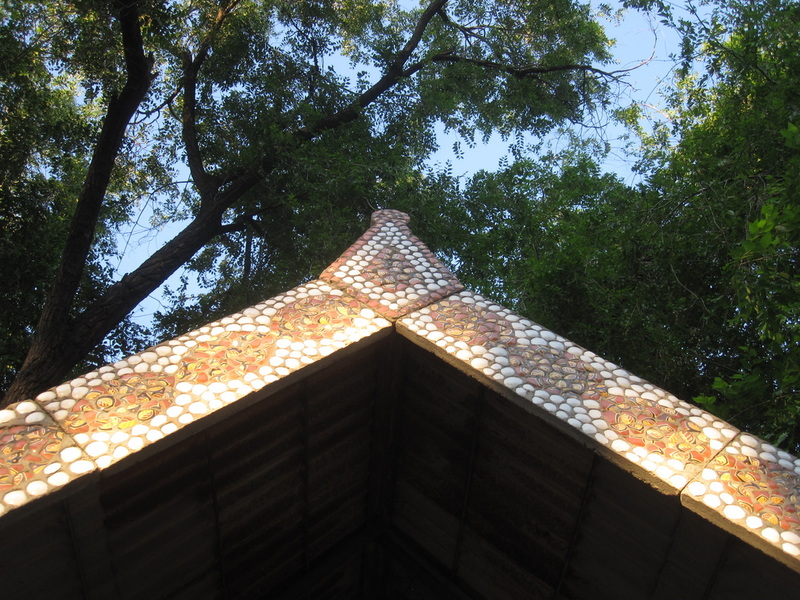 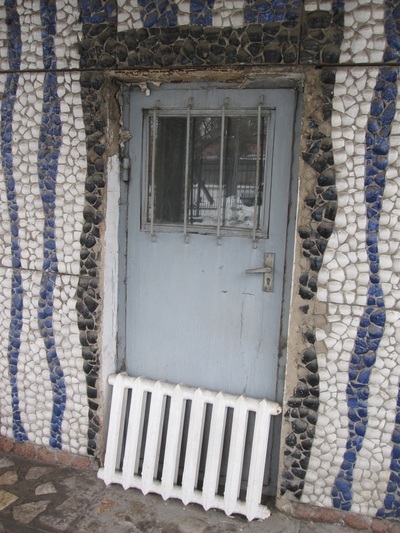 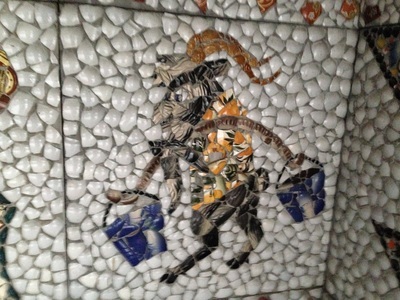 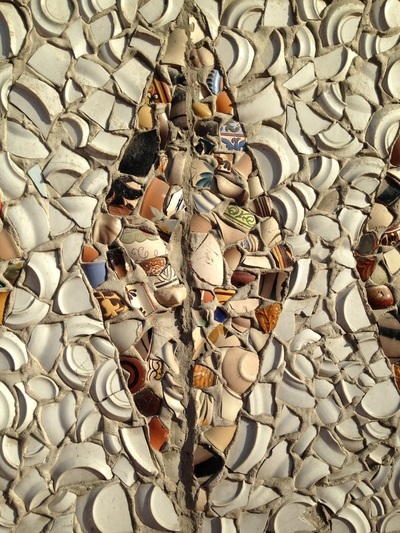 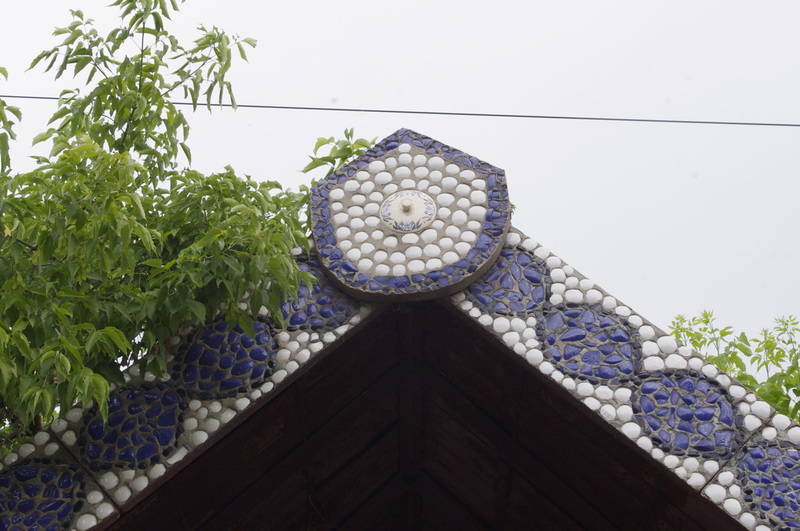 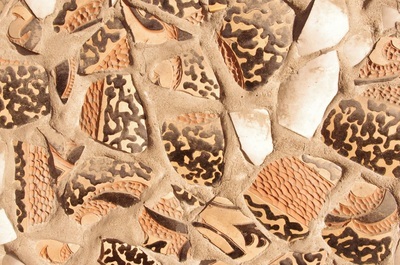 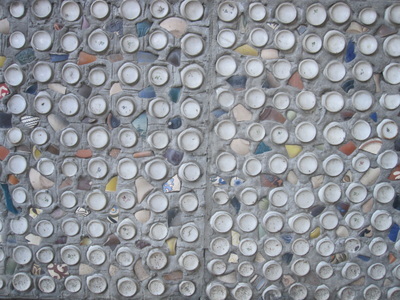 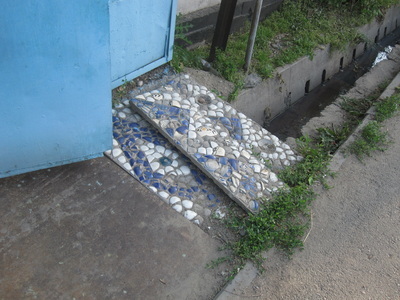 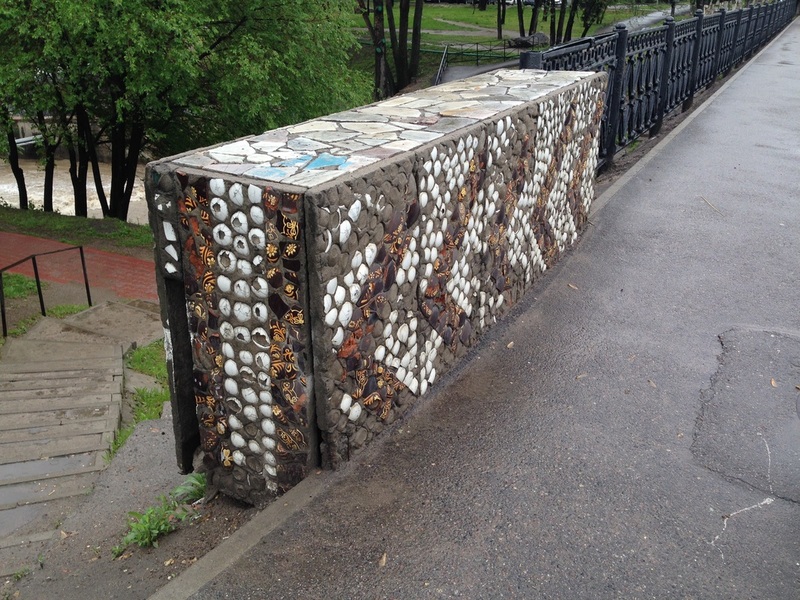 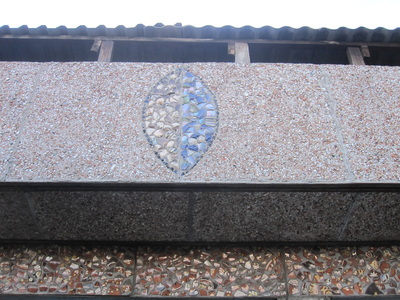 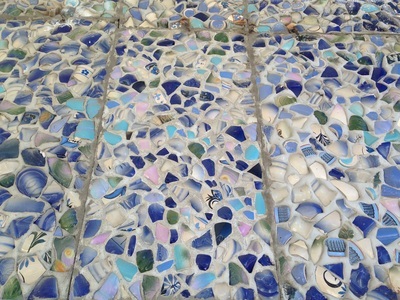 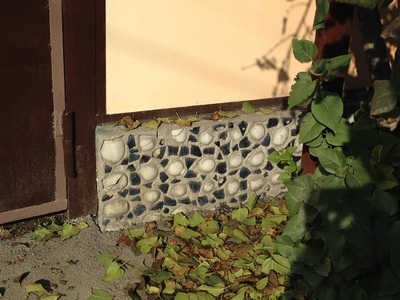 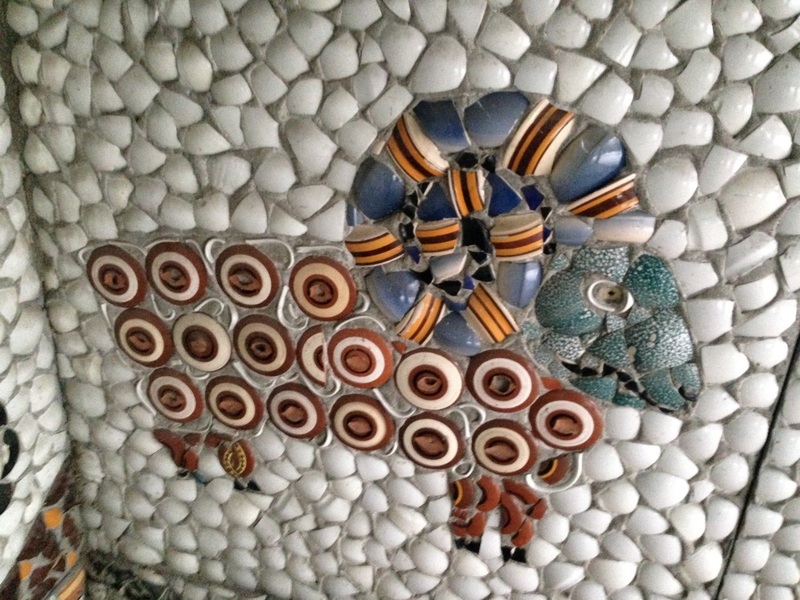 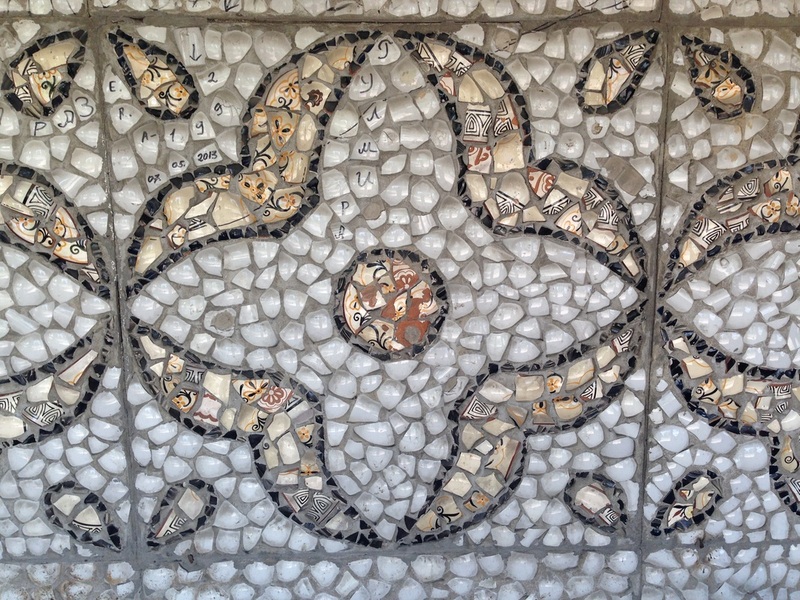 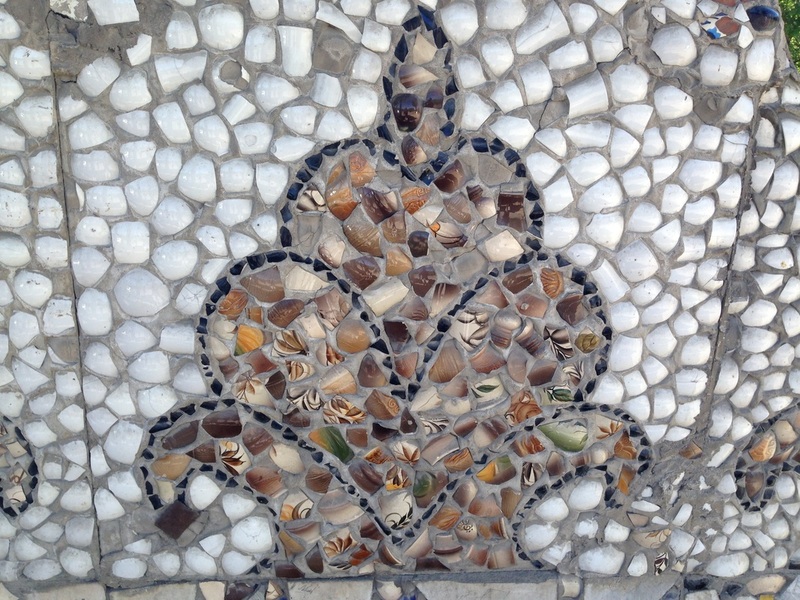 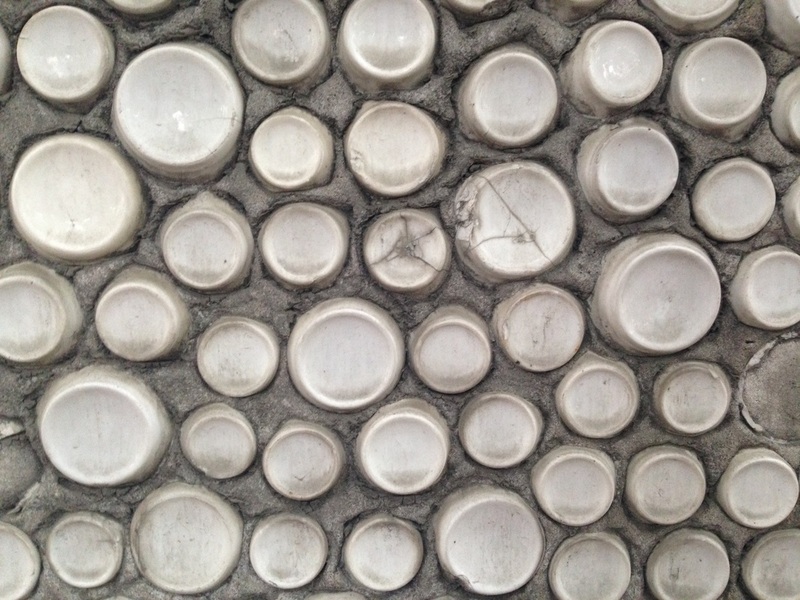 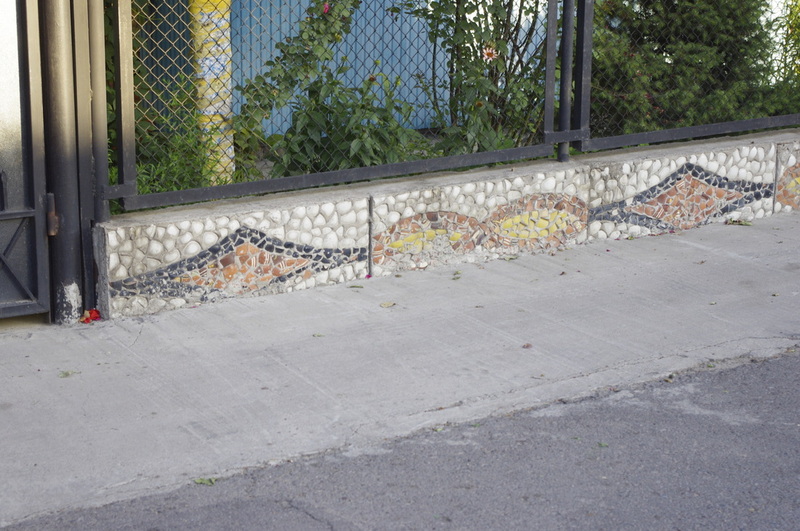 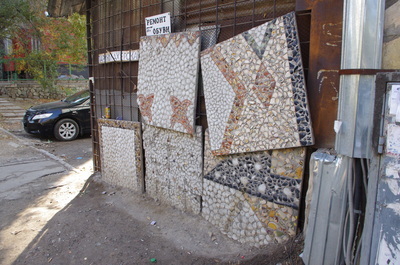 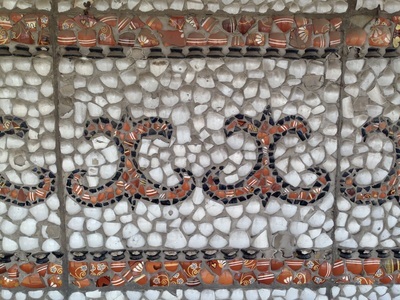 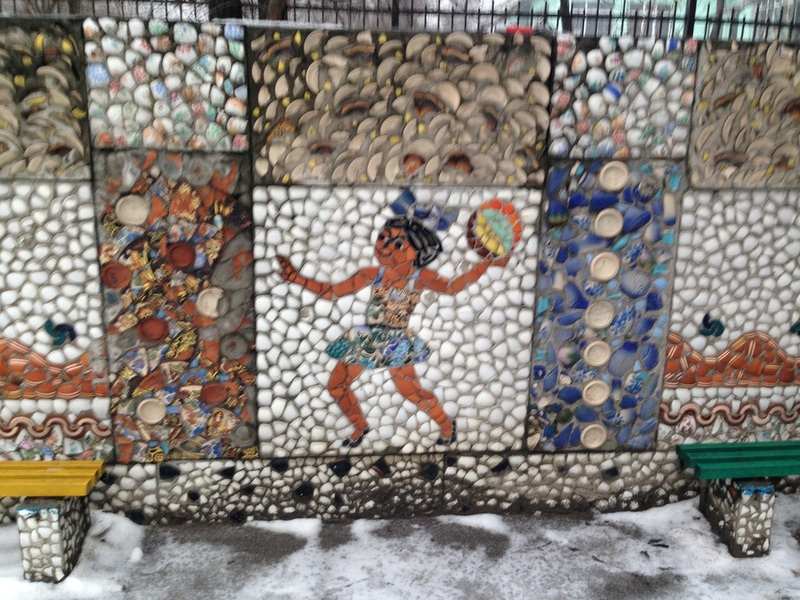 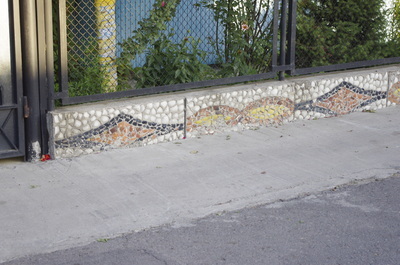 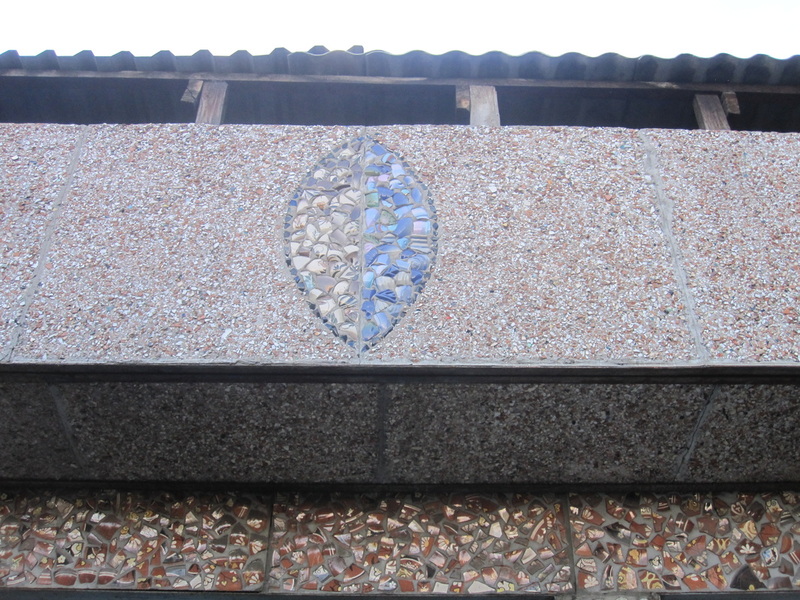 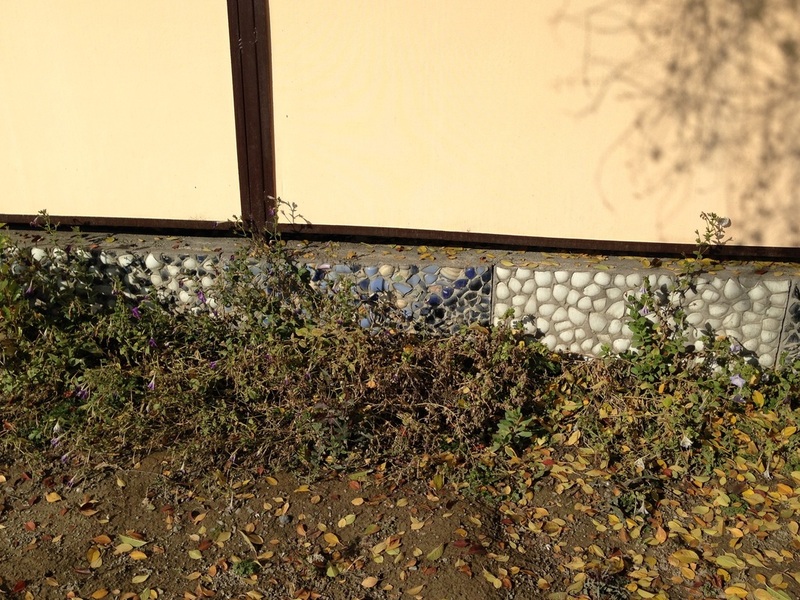 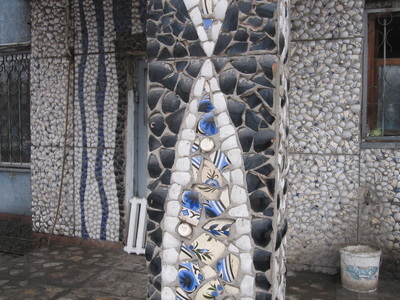 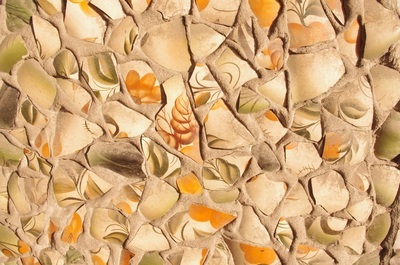 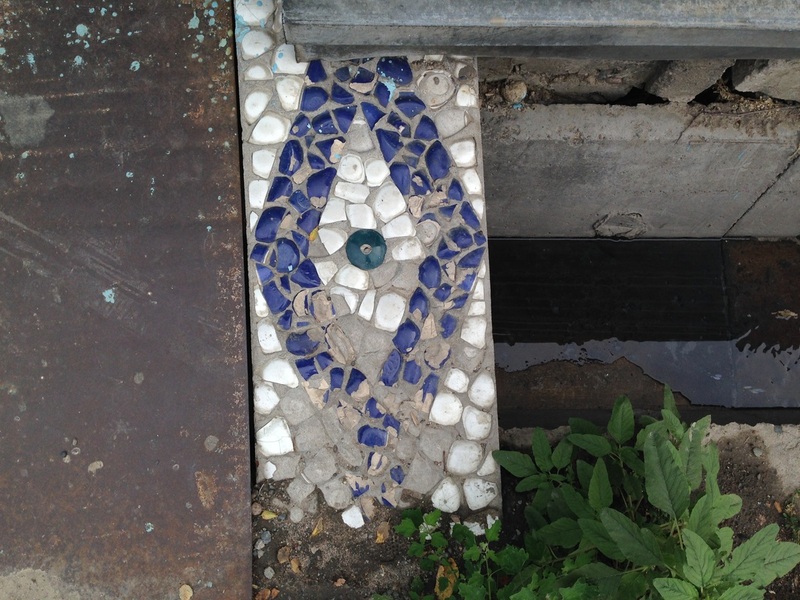 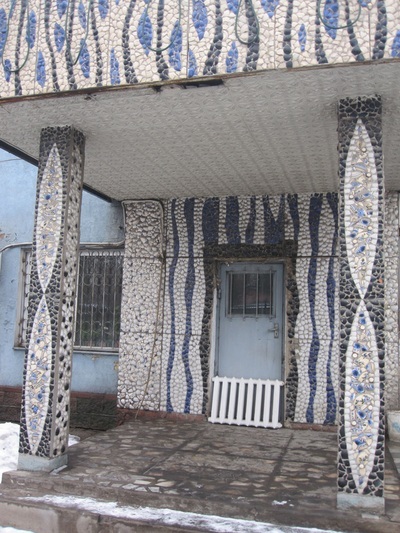 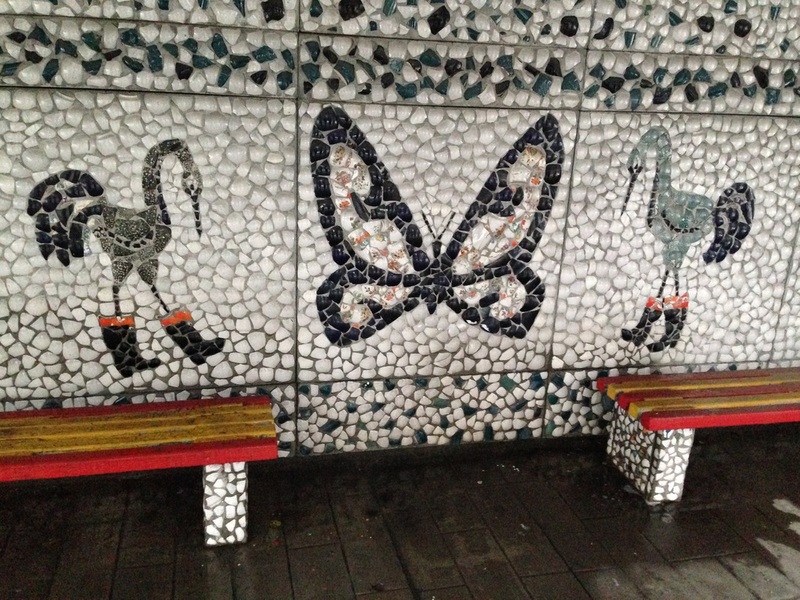 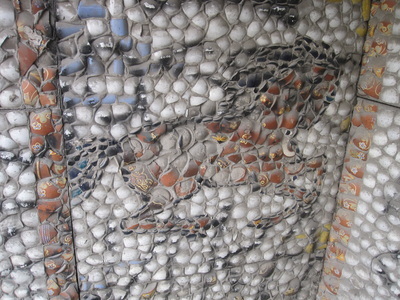 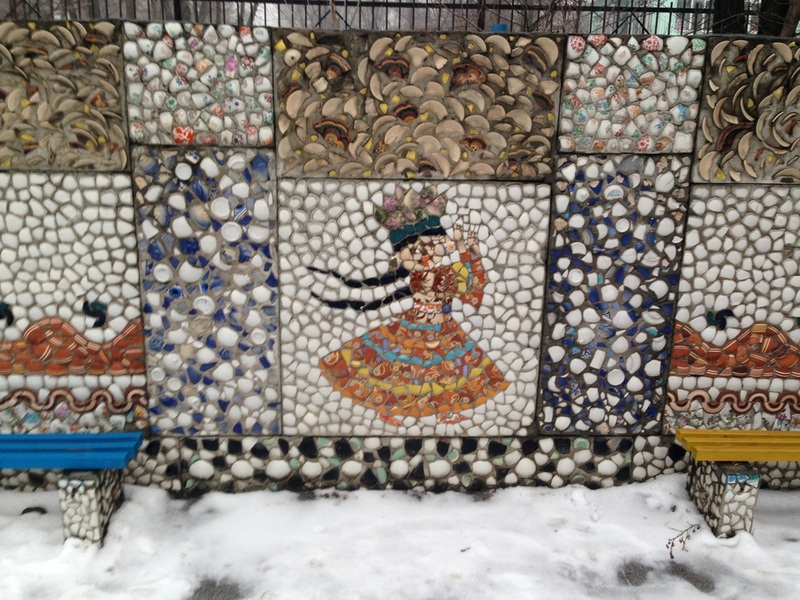 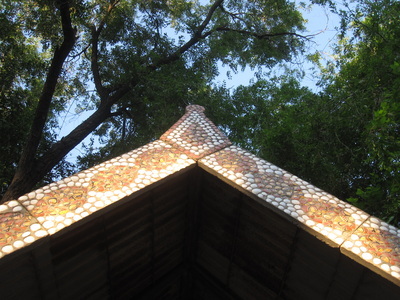 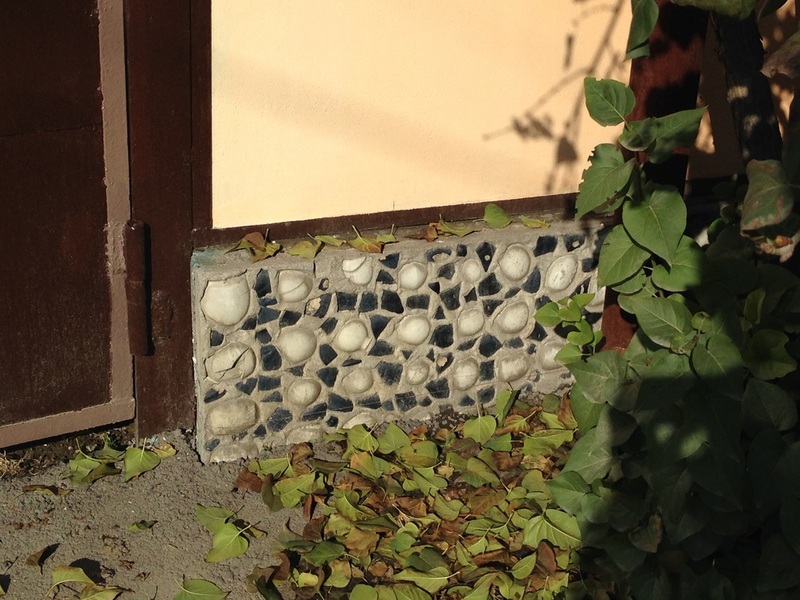 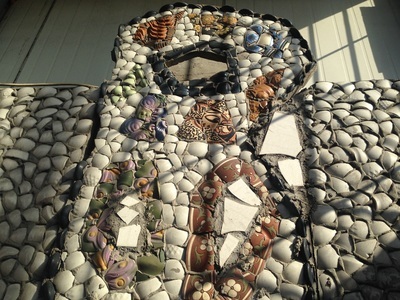 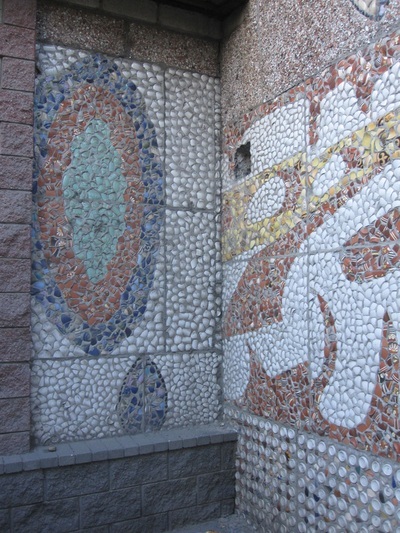 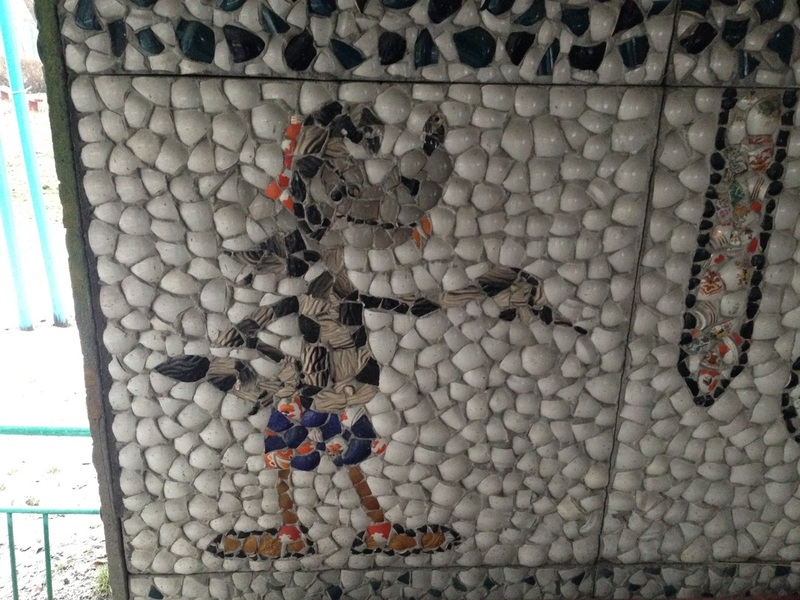 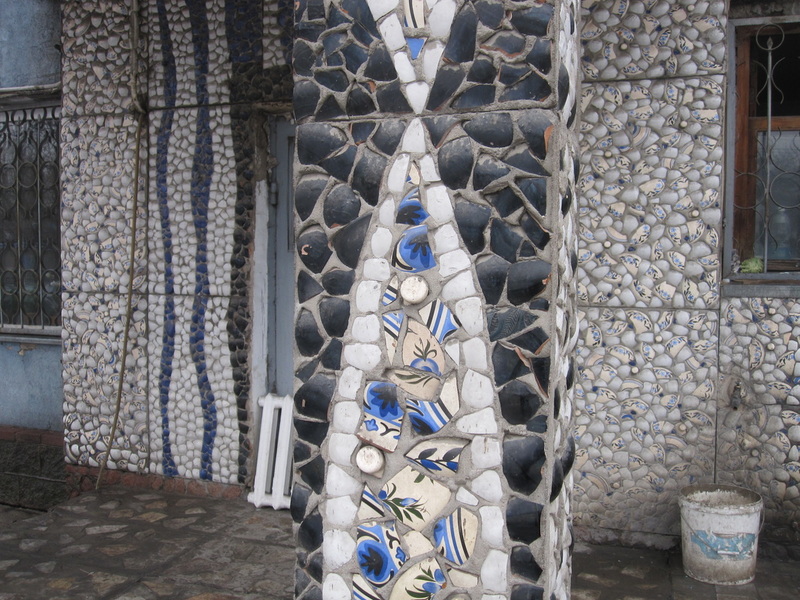 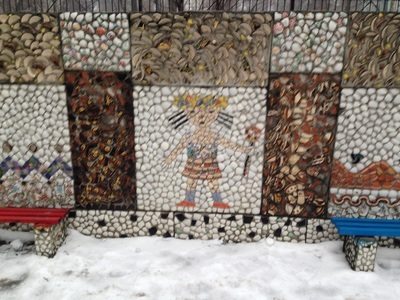 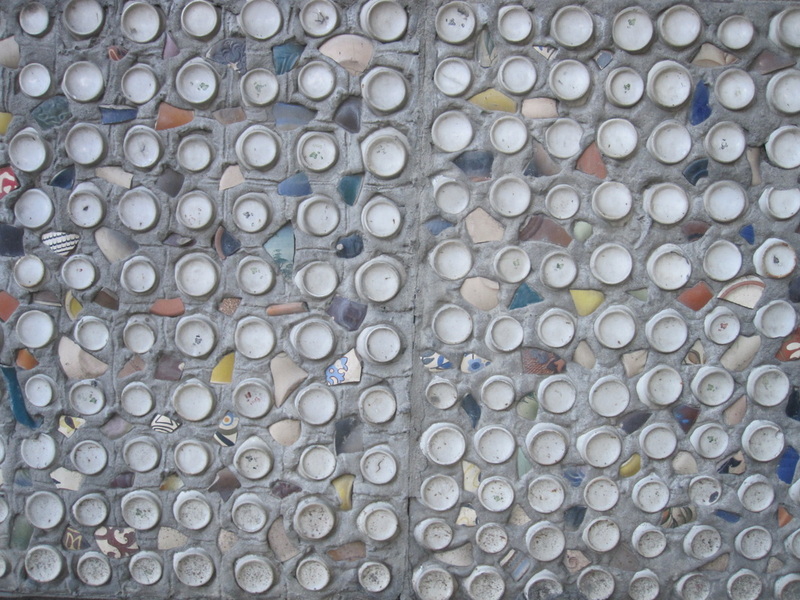 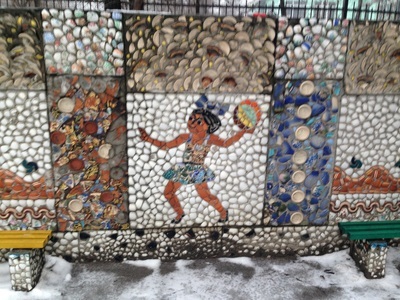 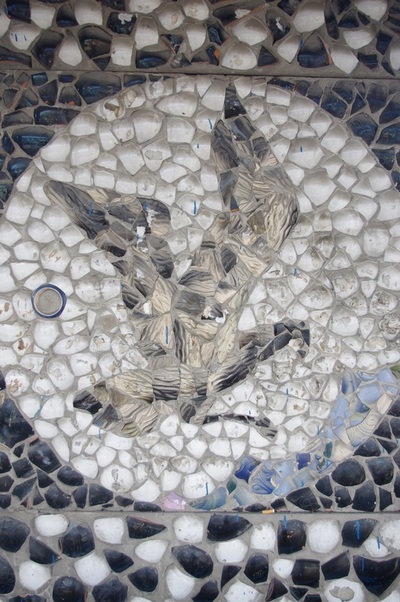 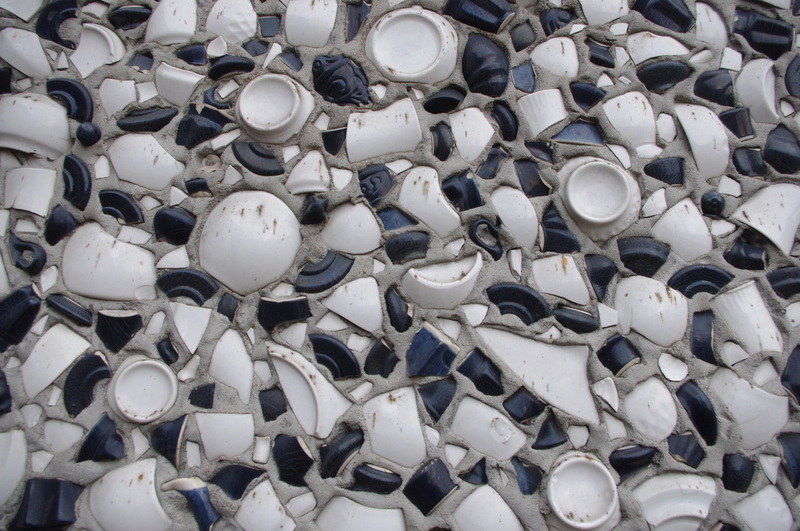 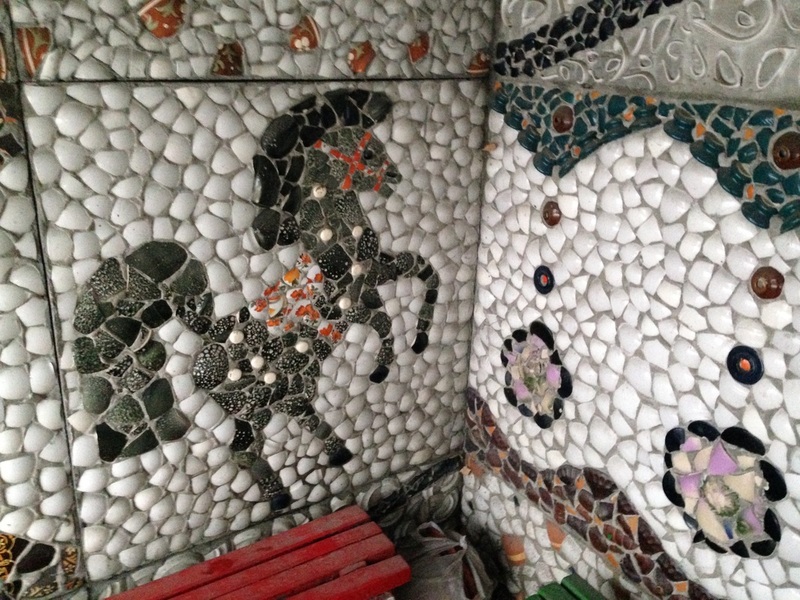 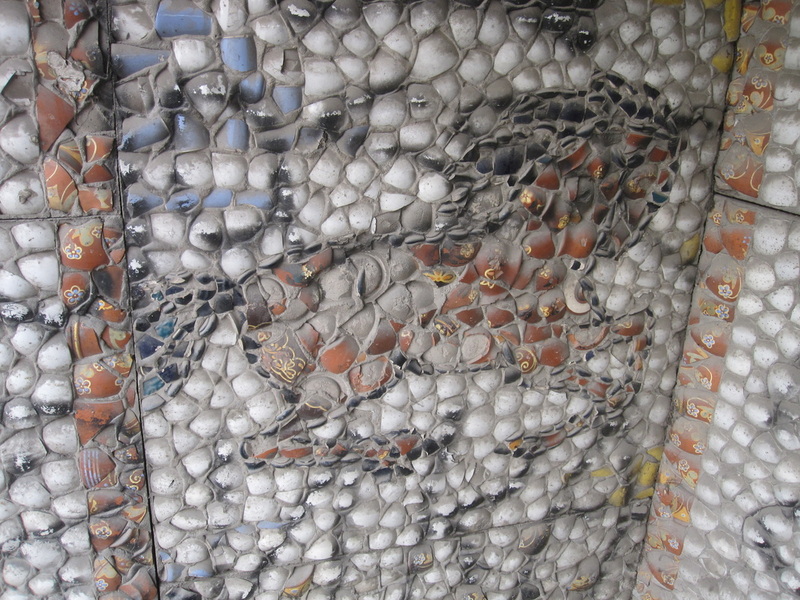 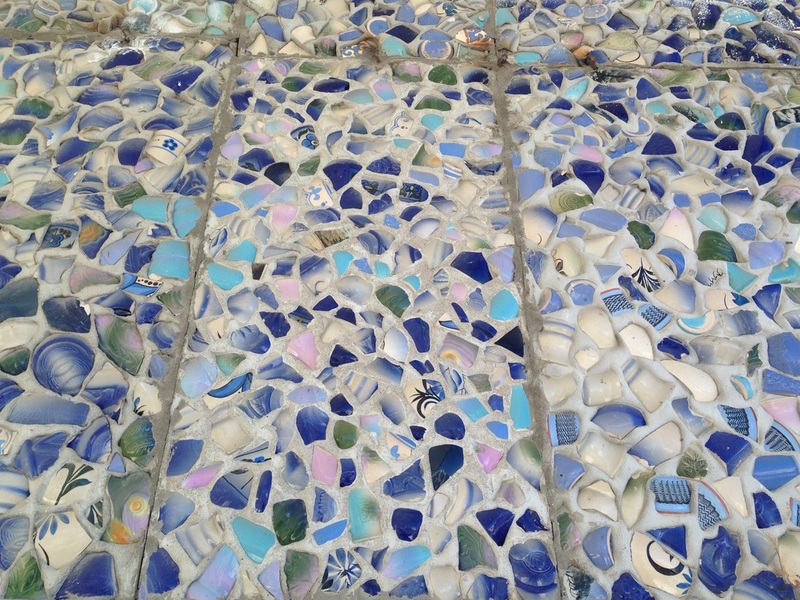 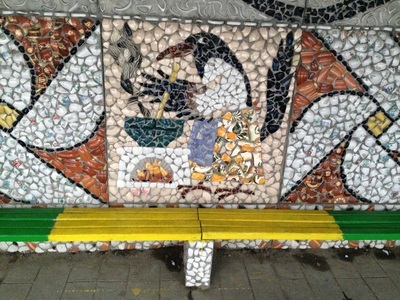 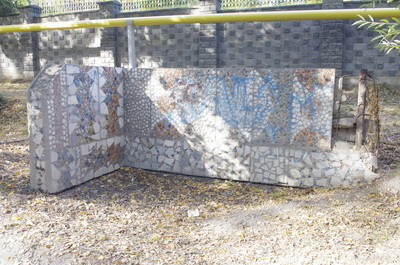 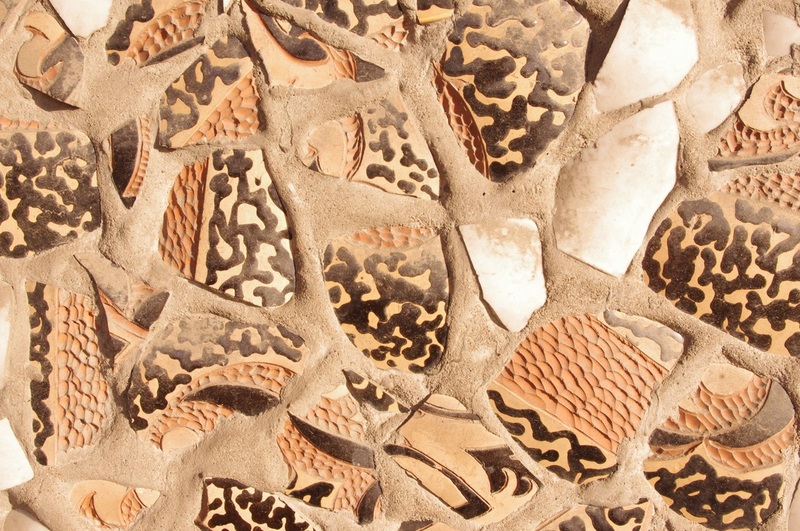 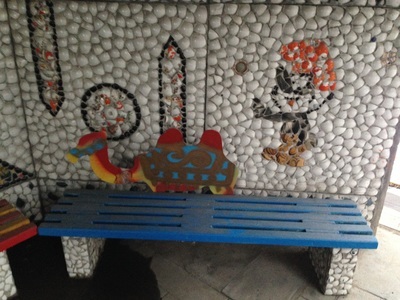 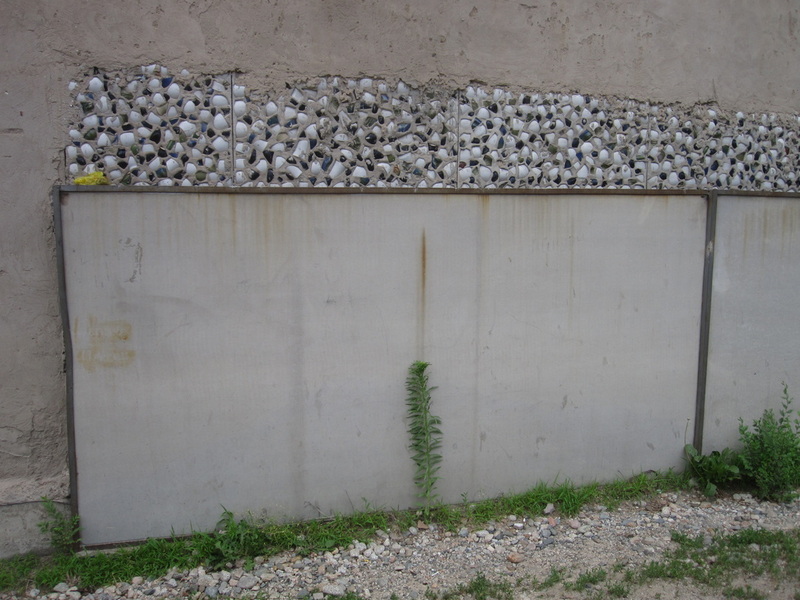 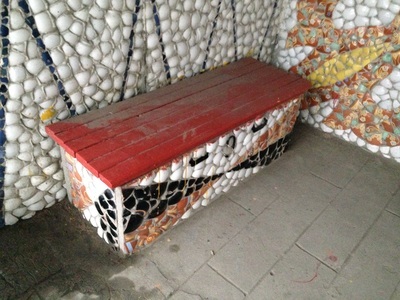 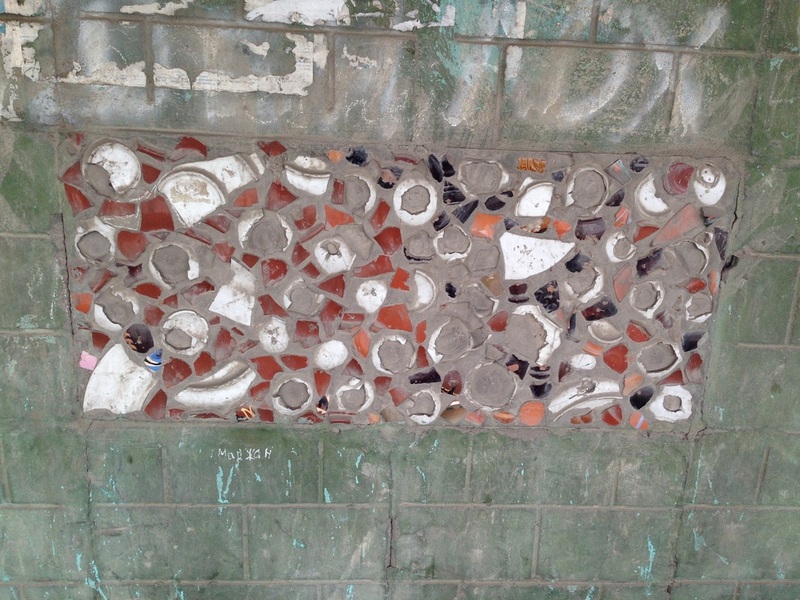 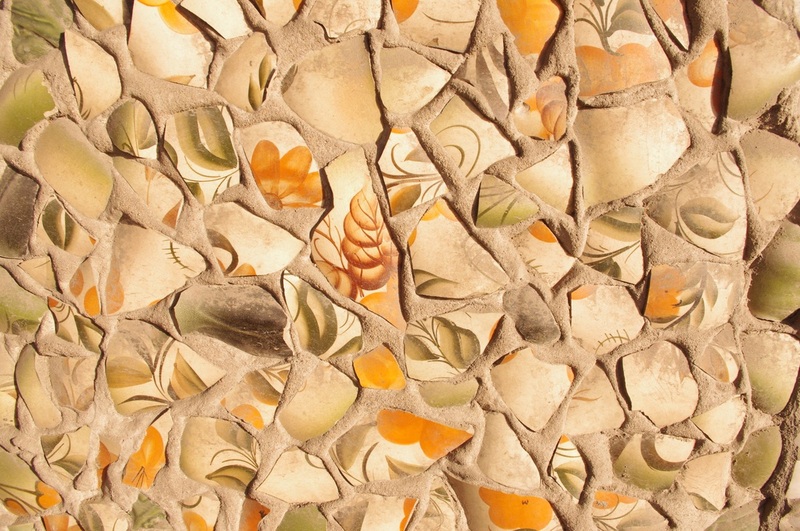 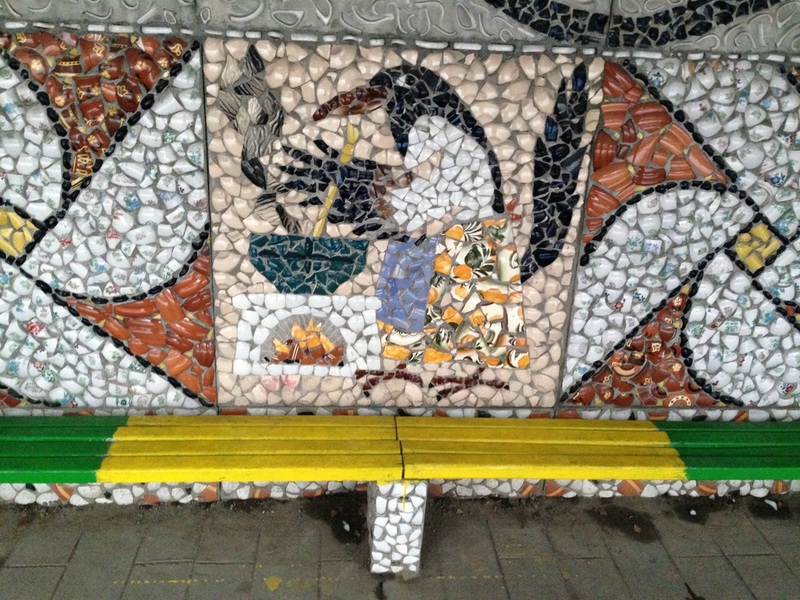 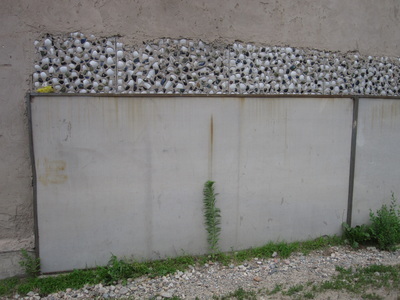 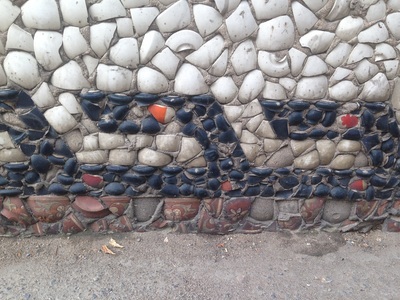 I began to see these pottery mosaics used as building materials in places I wouldn't expect. 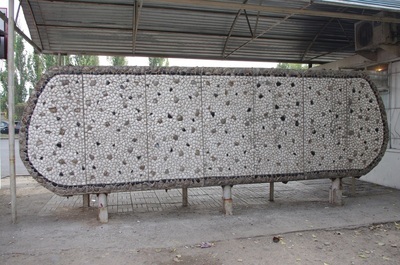 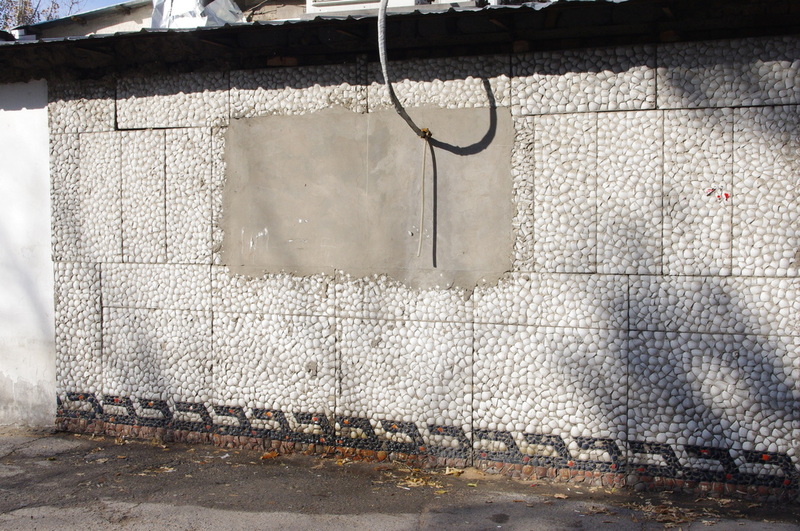 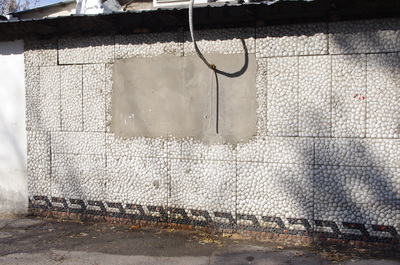 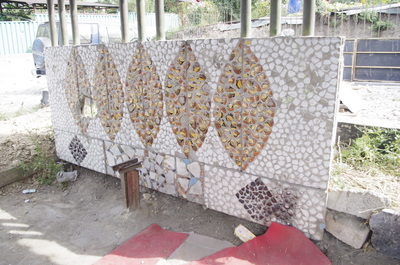 Concrete panels cluttered with the shards had been used to clad a cheap cafe, a one-star hotel, a police kiosk. Then I saw them used to as balcony panels on prefab highrises, and when I started to see pottery used in garden fencing and the exterior walls of people's homes, I had to wonder. 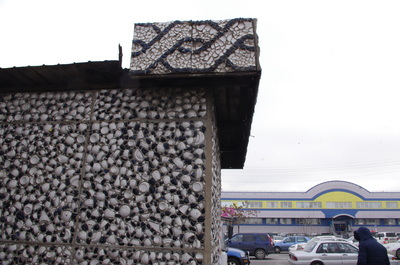 Was there some aftermarket for state building materials? 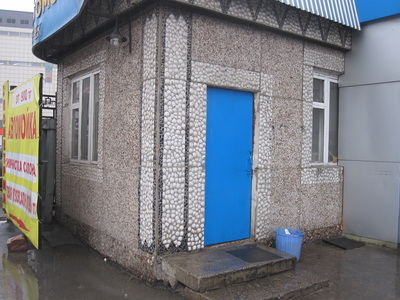 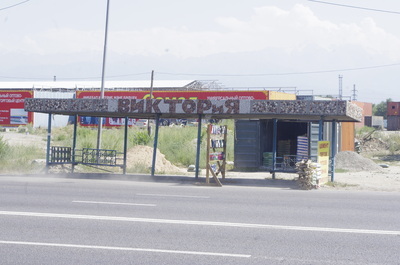 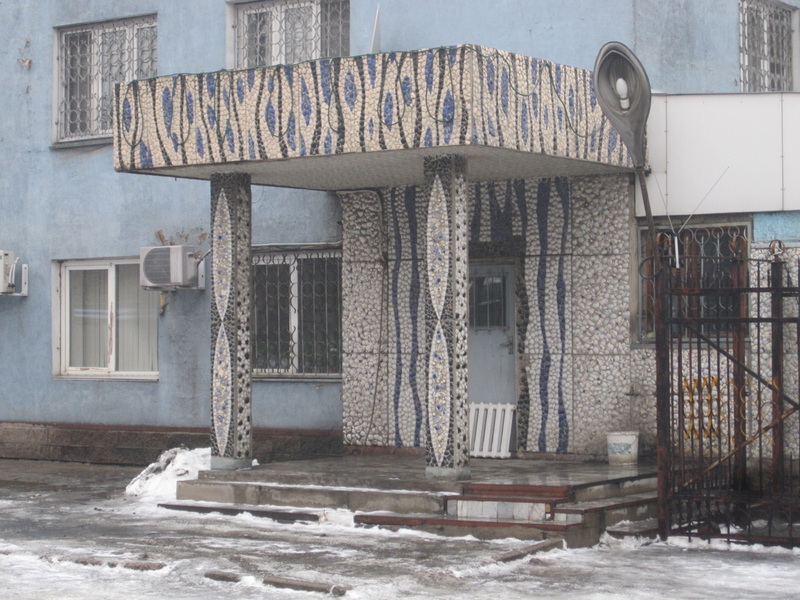 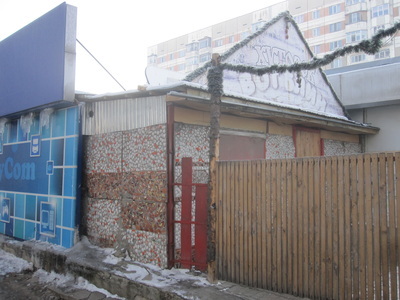 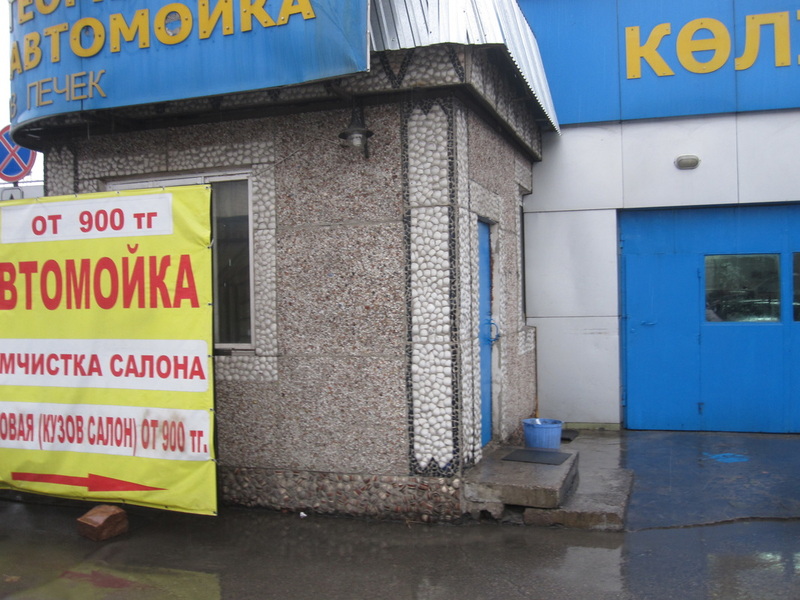 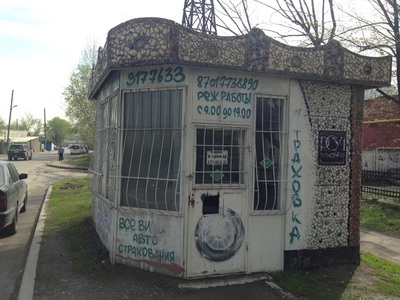 Did the 1990s decimate the Soviet bus stop bureau and send its building materials flying outward to the free market? 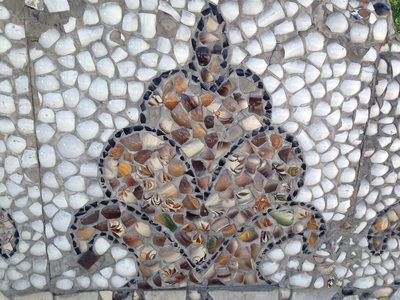 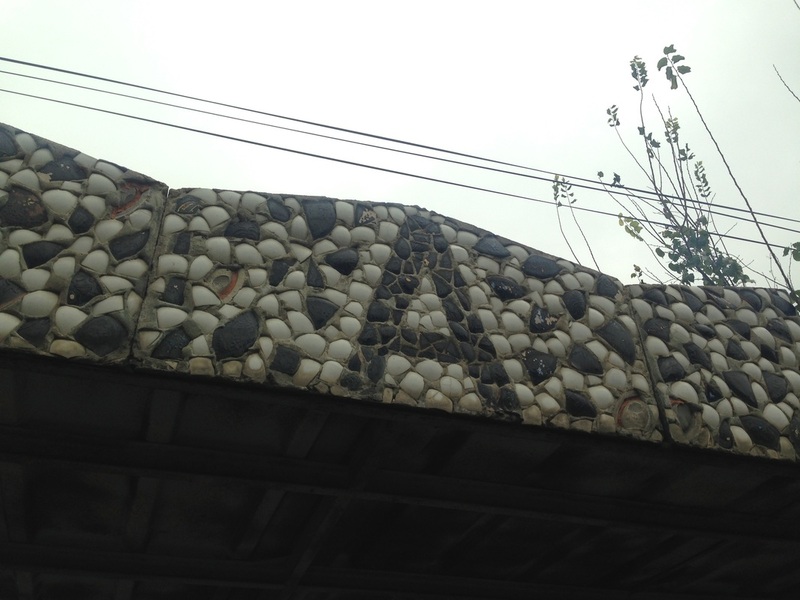 Did Ministry of Transportation workers get to take home mosaics for their New Year's bonuses? 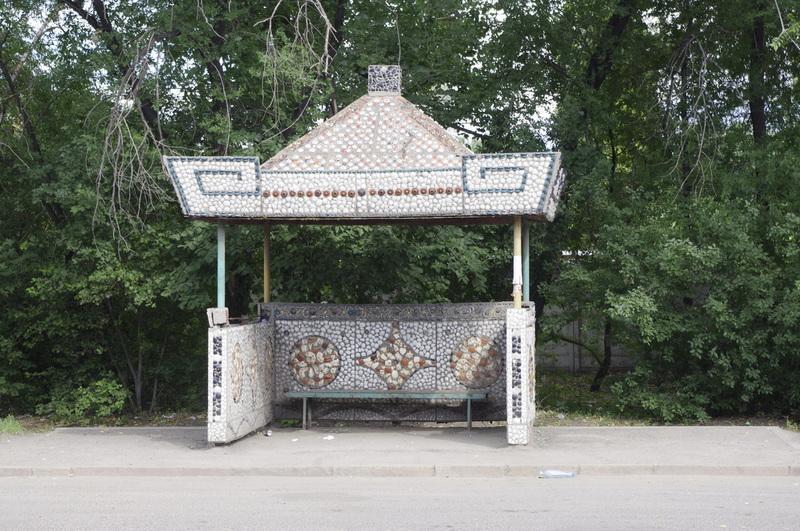 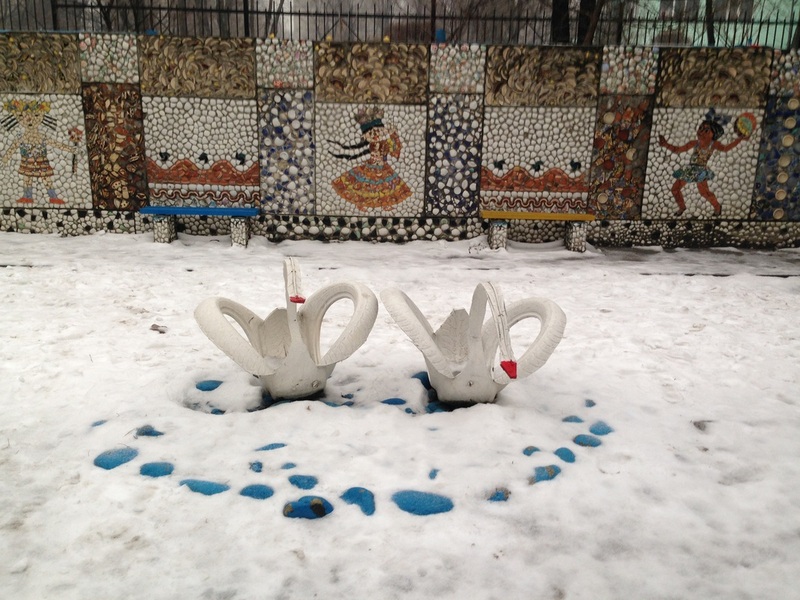 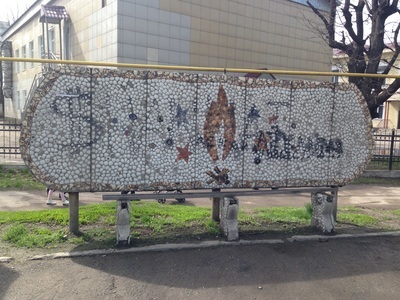 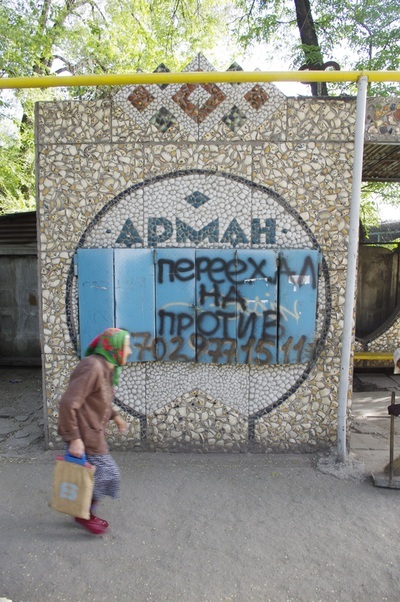 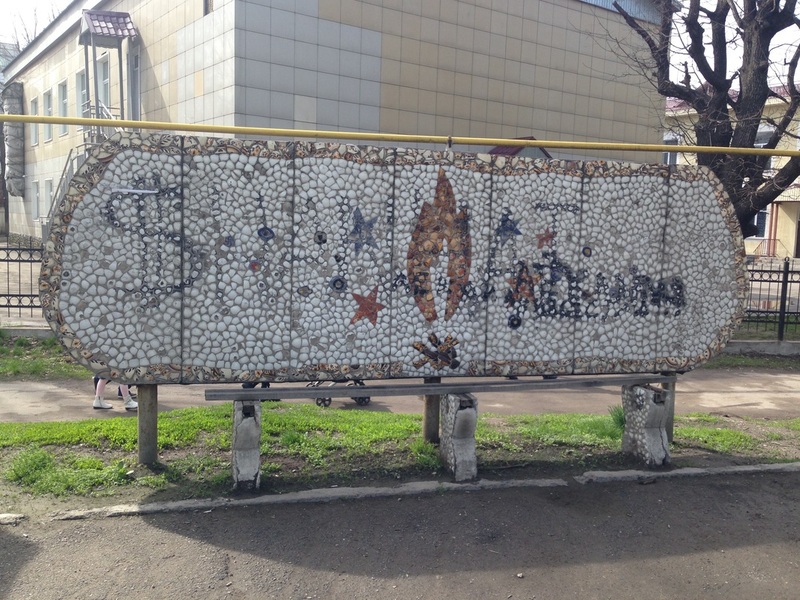 It remains of the many unsolved mysteries of Walking Almaty.